That illiterate light , is with us every night. 10 years or so ago, Phil, my good friend played me a track called “California Stars”. It is an old Woody Guthrie song and was recreated (along with a whole host of others) to form the album “Mermaid Avenue” as performed by Billy Bragg & Wilco. Little did I know it then, but a love affair was born with a band from Chicago. In 2004, I saw Wilco at Manchester Academy. The band were fantastic, great musicians all, but together….just fantastic. But the thing that struck me was just how fragile the vocalist (Jeff Tweedy) seemed. There was a vague rumour of an addiction (not eased by the lyrics of songs like “Handshake Drugs”) and I was utterly convinced that he wasn’t long for this world. I committed to seeing them whenever I could and saw them again later that year at Nottinghams’ Rock City. A fabulous live band. With the subsequent addition of the jazz inflected shredding guitar of the mighty Nels Cline, they’re even better. I saw them most recently on the tour for their most recent album “The Whole Love” – again at Manchester Academy on a day when we buried an old college friend of mine. I don’t know if the emotion of the day caught up with me, but the performance was one of the greatest of any band I’ve ever seen (and I’ve seen a lot). It started with this track “Art of Almost“, the lead track from the album. I had to share that too. Hold with it until the music fades and Glenn Kotche starts a whipcrack drum beat at about 4:43. Then watch/listen Nels Cline go! (The mans hands BLEED after performances!). Do you know what, the memory of that concert – and the whole day – still gets me. We could get into the “Yankee Hotel Foxtrot” situation / mythology – but I’ll let you find that for yourself. The band are MORE than worth a listen. On to the beer eh? Today, I’m going off on a beery tangent – shop wise. I am a huge supporter of small independent beer shops. They provide knowledgeable service, combined with beers you simply won’t find in any supermarket. I don’t think that there is an exception to that rule. But I love E H Booths – or simply Booths as they are now. They are a Northern chain and are positioned (I would say) at The Waitrose end of the spectrum. The artisanal foods that they stock, the breads, the deli counter, they rock my boat….but oh, the beer…. It was about 2003 and I was driving along Penwortham Way from Preston toward Leyland when I spotted (from the corner of my eye), a supermarket just off a roundabout and resolved to go in, which I did. I walked in with no preconceptions, no basket, no trolley and strolled – purposefully – towards the alcohol section. Bypassing the wines & spirits, I arrived at the beer section. My jaw dropped. I had simply never seen so many beers in a shop. The first thing I noticed was Alaskan Smoked Porter…..I went to get a trolley…..and walked out with nearly £100 of beers I had (mostly) never seen, never mind drunk, previously. The birth of another love affair…. With my beer shopping being focused on small independent shops, I hadn’t been into their excellent Media City outlet – my next closest being Chorley – for a while. That is, until I wandered into a Twitter conversation which seemed to offer up a live online community tasting session. Inspired by the launch of 4 own branded beers sourced from the 4 counties in which they operate (Cheshire, Cumbria, Lancashire & Yorkshire), they were hosting this session tasting 2 of those 4 beers with the #BoothsCheers hashtag and sending the two chosen beers to a number of people to join in, I butted in and they sent me two, but, on the day of the tasting, I missed the delivery, so, improvising, I went to Media City to pick the two up – and walked out with 19 bottles! I chatted with a couple of the staff including the manager of the Alcohol section (really friendly) who helped me to find a couple of beers I couldn’t locate, the service is impeccable. I even tried to blag a raffle prize for the Salford Beer Festival…….well…he didn’t say no and even said he’d like to come….that’s ticket number 1 sold then! And before you say anything…This is most certainly NOT an advertorial….Confidentially speaking….some local blogs do that…I don’t. These were all paid for. By me! This was a bright straw yellow gold and had a slight chill haze, with a white head and a slight fruity aroma with peach and a hint of spice. In the mouth, this is medium-bodied with a good rich tea malt base and was quite fruity and dry with a note that reminded me of grape skins. That biscuity malt gave a slight sweetness that was offset by quite a bitter kick. 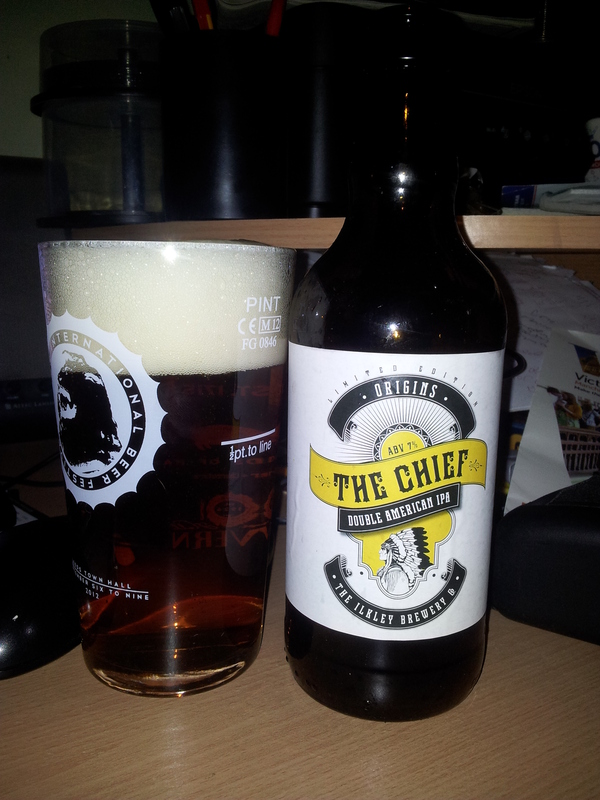 A really refreshing mouthful with a substantial spicy hop finish and a lingering herbal hop grassy aftertaste. First from this Brewery and a really good British Lager. I *may* have bought one or two more from Eden’s range……maybe…. Only my second from Roosters in bottle (following the excellent High Tea). I was delighted to see both this and their Coffee Porter “Londinium” on the shelves and MAY have snapped up a bottle or 2…..
A beautiful bright golden with a white fluffy head and a full booming aroma with sweet lemon and tart gooseberry, enough to make my saliva gland go into overdrive! Medium-bodied and fruity with a kind of lemon sherbet on a base of fresh white bread, this is so smooth and easy drinking. Each mouthful as fruity and zingy as the first. Perfect summer drinking. Fresh as a daisy, sweet fruity and very moreish. A classy Pale Ale. I could go at this all night…. The one thing that can be said about Yorkshire Micros…They were never going to leave “Le Grand Depart” of the Tour De France uncommemorated, were they? 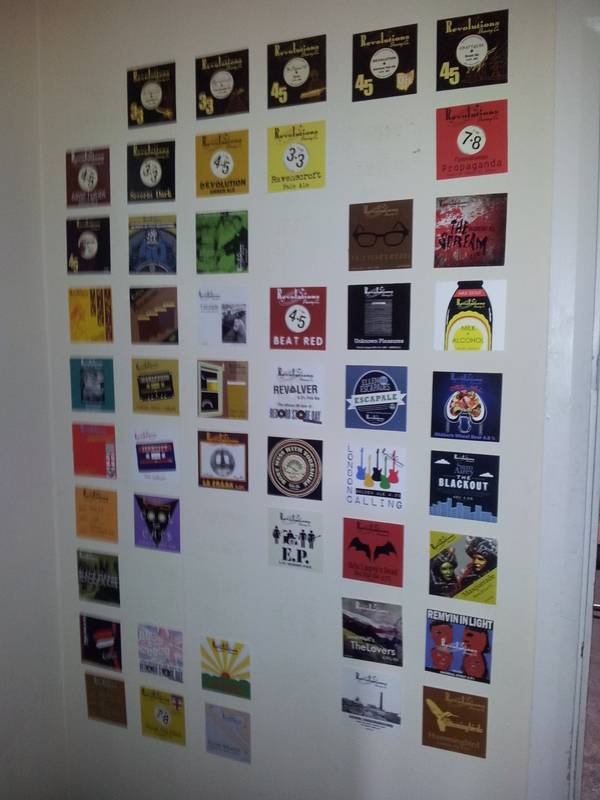 To be fair, I’ve had some belting beers loosely Tour themed. 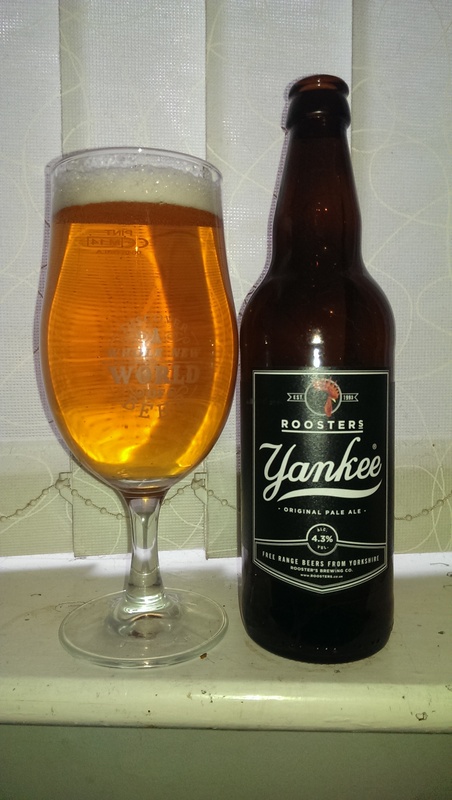 This was another..
Golden, white head, subtle fruity aroma with a little peach or nectarine. 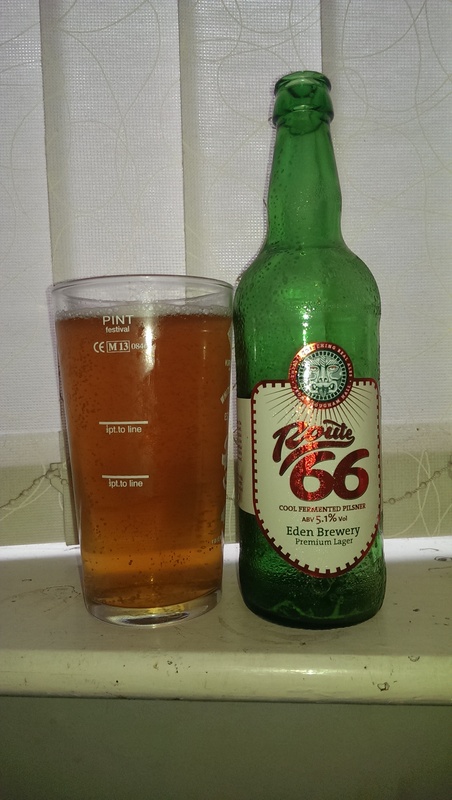 This is quite full bodied for the strength with a good solid biscuity malt body, some grape fruitiness, nicely sharp, clean and fresh tasting, along with a gentle peach leading to a subtle bitterness. Really dry tart aftertaste too. This was smoothly carbonated lending itself to a really smooth easy drinking beer. Lovely. This was a really pleasant surprise on the shelves near the lift. Tyne Bank are a rarity to me. Last time I had any was IndyManBeerCon in 2012! So I had to…didn’t I? Especially with my love of the Darkside! Black with a slight ruby glow and a light mocha coloured head and an aroma of light coffee with a gentle whiff of cherry. Full bodied smooth in the mouth, initial flavour is Bournville chocolate, sweet but with a certain depth. Then in comes some cherry – not overpowering, unlike some beers that use it – which complements the chocolate really well with a slightly sour tinge. This is excellent. The Oatmeal lends the beer a silkiness which adds to the sense of balance. Mouthful after mouthful, this is a lovely smooth flavoursome beer. Silky from the oats, with that cherry ohhh …… And at a couple of quid, feels like shoplifting! 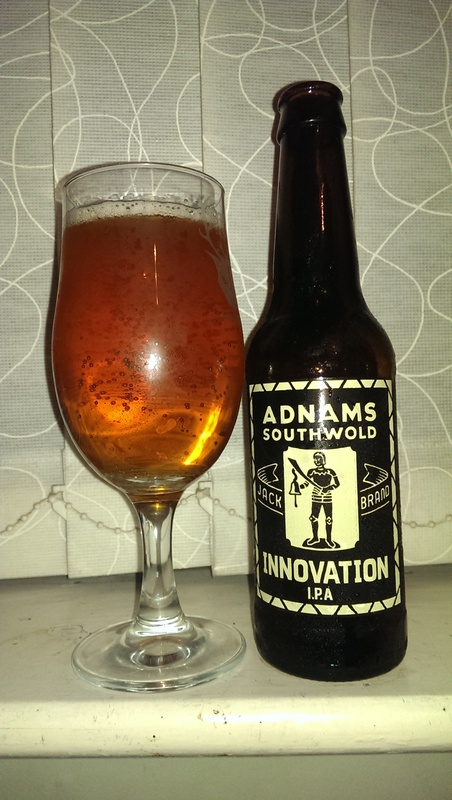 Having heard a lot about the Adnams “craft” range (and this beer in particular) from luminaries like Nathaniel Southwood, I was keen to try this and rather pleased when I saw it on the shelves – especially at £1.99! Deep golden coloured beer with a light white head and booming citrus aroma all apricot and grapefruit, so fragrant. Full bodied and just SO SMOOTH. The first mouthful is all big juicy malt sweetness with a fruitiness which is more like a grapefruit marmalade, sticky and juicy. There’s a barley sugar element to this but it’s more than balanced by the fruit and a restrained bitterness. The finish is really quite dry with a fresh-cut grass and insistent resinous pine. A really good IPA in its own right, but probably the best “craft” offering I’ve had so far from one of the regionals. Yeah. Just about sums it up. This was the first of the beers in the #BoothsCheers Twitter Tasting. 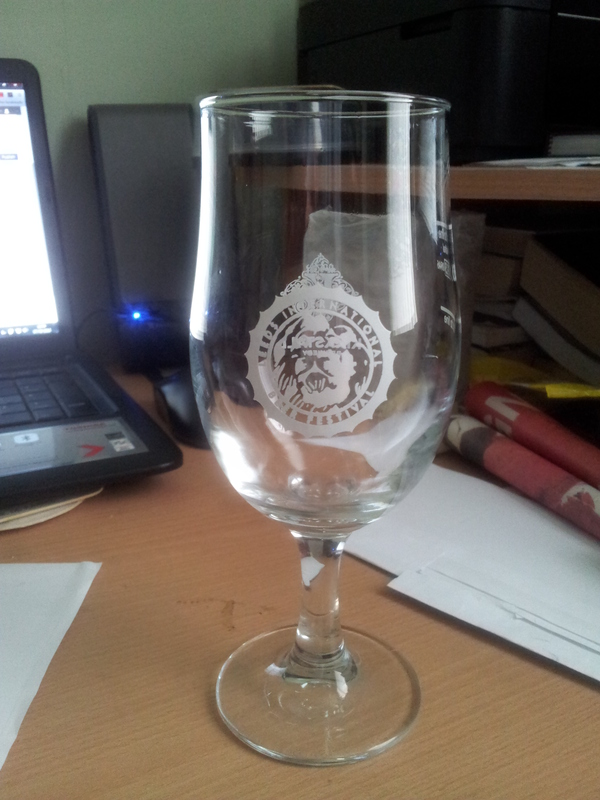 But, give that I missed the delivery, I bought this and the Golden Ale (also excellent). It was more than worth it. In the mouth, this was full-bodied, with the instant shock of mango and grapefruit coming from a black beer brought back down to dark reality by a touch of treacle, a lashing of licorice and more than a chunk of bitter chocolate. This flavour fiesta is rounded off by a substantial resinous aftertaste. Just a cracking beer. I do like a Black IPA me, I do! 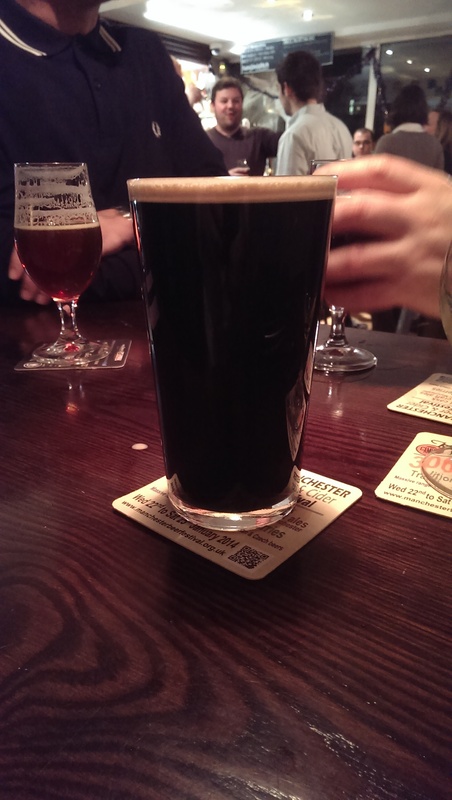 As Connor put it at the time….”Everything a Black IPA should be” – I’m such a plagiarist! Well, that’s it. If you’re going to shop in a supermarket for beer, honestly, look no further. We’re a lucky bunch in the North! Been a busy month all told has October. Yes, I KNOW it’s November/Movember or whatever you want to call it, but in MY head, I haven’t really wrapped up last month! What with the marathon that was The Road To Wigan Beer in all 7 excellent Allgates Brewery pubs, then IndymanBeerCon I had to calm down a bit until the MTB with Harbour Brewing! Anyhow, there have been some excellent bottles that the metaphorical trumpet needs blowing about, which (I have only just noticed) are all from Yorkshire! So, without further ado…. We’ll start on the dark side….. Almost black with a beige head and aroma of chocolate and cocoa powder. Chocolate malty sweetness in the mouth balanced with quite a degree of bitterness. Quite grassy and a lingering resinous bitterness in the afters. A nice beer indeed for the strength and even better on cask when I had it recently at Pie & Ale! A deep ruby (not quite black) beer. Slightly spicy and tart aroma (the cranberries ?). Medium bodied creamy texture with chocolate initially in the mouth but with an increasing tartness and a building sweet / sour note from the lactose which stays with you through the glass. The finish was dry with some coffee notes and a degree of bitterness. 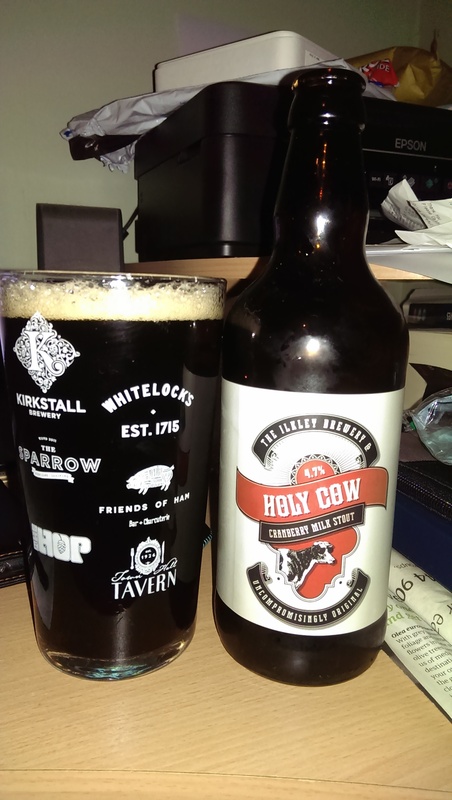 When I had this beer on draught at the National Winter Ales fest, I thought it a nice Milk Stout but couldn’t detect the cranberry. Something I couldn’t accuse the bottle of lacking! A truly excellent beer. 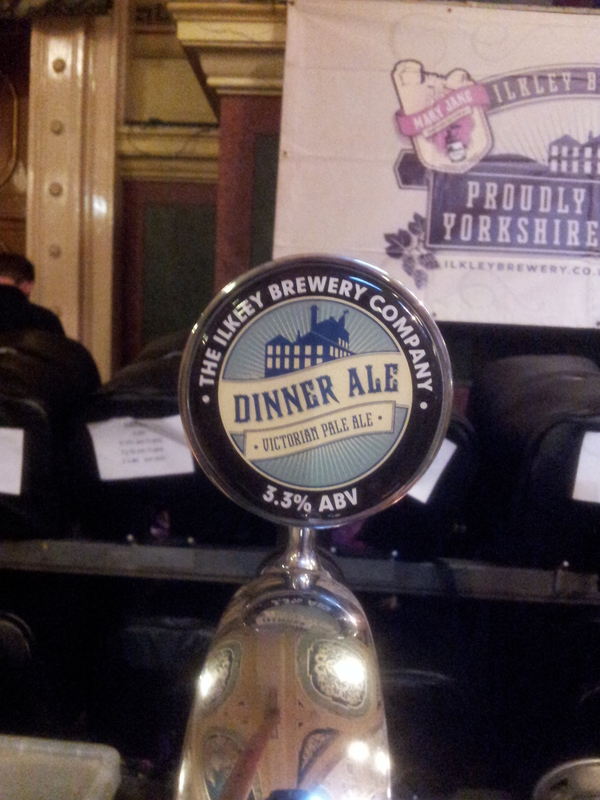 Vicky from Yorkshire Ales passed me this one to see what I thought. Given some of the reviews that I had seen on social media, I was tad wary. I’ve seen their website (an impressive piece of work!) and the branding and statements lead one to expect a hop monster. Something it is not. Expectations eh? What it is, is a nice easy drinking pale ale. Lively golden coloured beer with a white lacey head and an aroma of sherbet lemon with some kiwi. Lemon sherbet too in the mouth on a sweetish biscuit base with a gentle increasing bitterness and a slightly resinous dry finish. A refreshing beer. As I said, on the branding alone, I expected something hoppier, but it’s a nice refreshing beer. Now then. Where do we start? A cloudy yellow golden beer with an aroma like a mash-up of lemon and grapefruit with added clove spicy sweetness and spring grass. Medium bodied again, with initial touches of banana and clove but, whoa – a real hoppy hit with this. I know it said it was an American hopped Weizen, but it surprised me nonetheless! Really nice bitterness with this with a herbal, grassy almost piney finish. A “heck” of a surprise (groan!) this. A superb beer! With each bottle of their single hopped pales, I fall increasingly in love with this brewery. I just need to have more on draught! Pale gold (as you can see!) with a white lacey head and a subtle but distinctive grapefruit aroma. A light malty base with a touch of balancing sweetness to allow the hops to do their thing. And they do! Over that sweetness comes a fabulously dry bitter grapefruit hit with an almost sticky pine. The resinous bitterness continues into a grassy finish with a lasting bitterness. Simply, a stunningly good beer! I’m not going to say it again about how they have………. 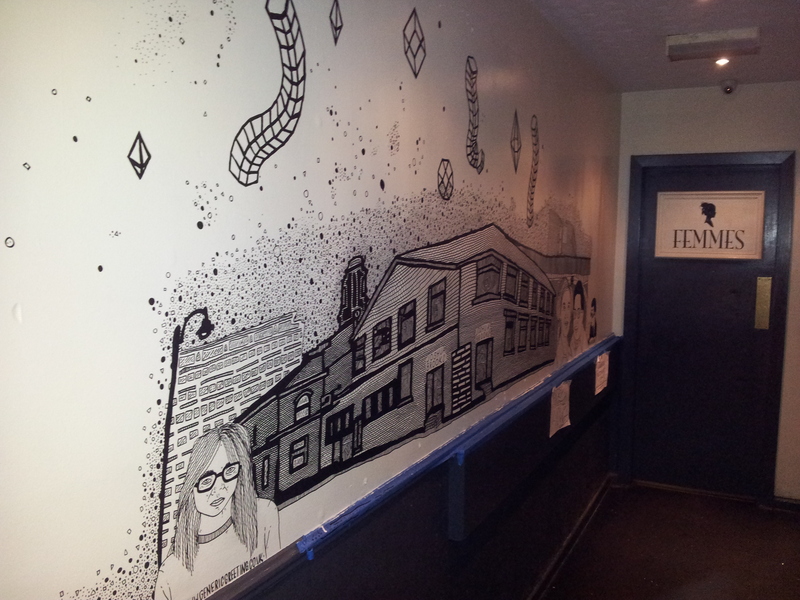 I want to live in Huddersfield! 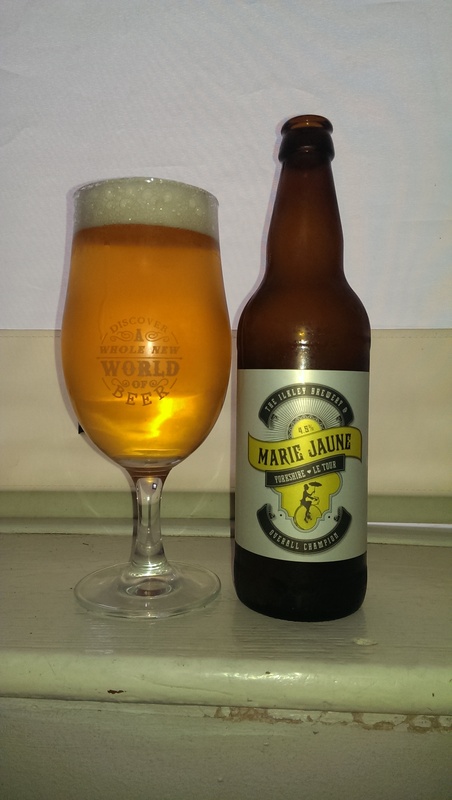 Palest gold, almost lagerish colour, with a hoppy heaven aroma of lemon and mango. A little cheesecake base sweetness with a big overlay of mango and bitter grapefruit and lemon. Gorgeously bitter with a crackingly dry piney aftertaste that stays and stays. Really surprisingly refreshing at this strength. Another superb beer from Mr Bastow! Just a shame that I STILL haven’t had any on draught!!! And oh have I tried! Well, that’s it. Other than to note my favourite beers this month! Had this at the recent MTB at Port Street and it stopped me in my tracks. Creamy coffee, lovely roasted malty goodness with a building bitterness. 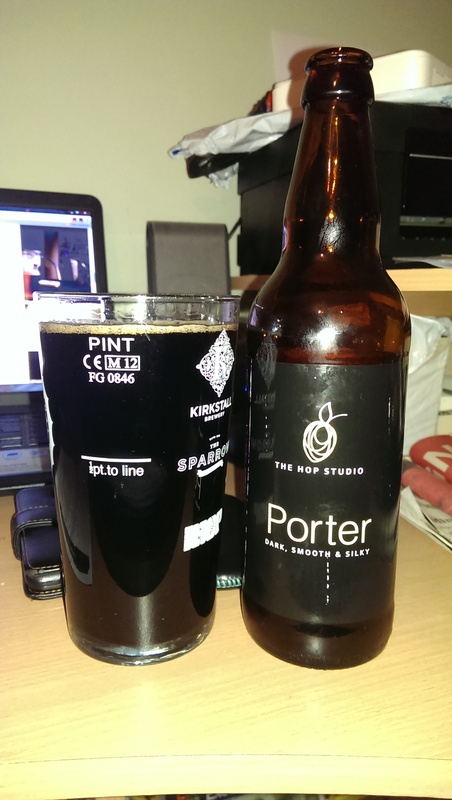 Simply the best porter I’ve had for quite a while! 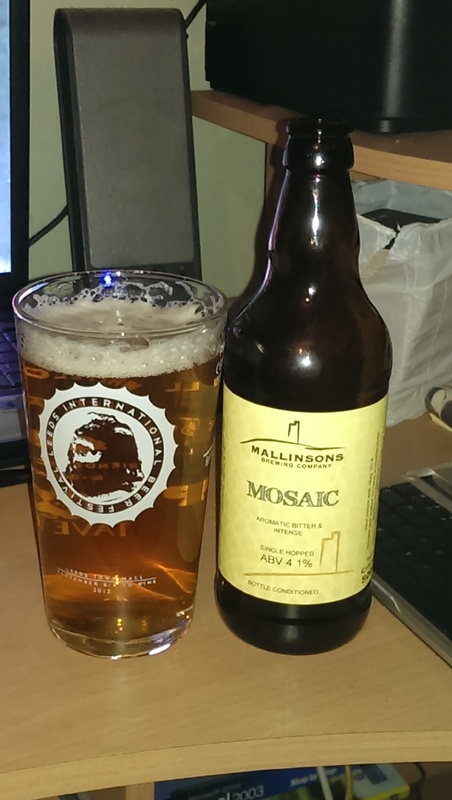 Bottle – Mosaic – Mallinsons Brewery – This was a close run thing with the Weird Beard / Northern Monk collab, but this single hopped pale just was SOOOO good! Read above. Well, that’s it for now. 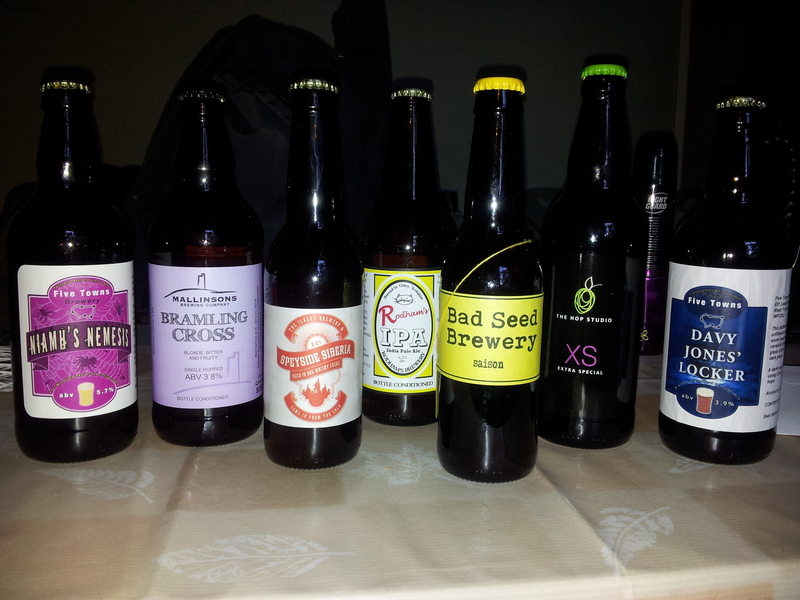 Next up (following some purchases from The Liquor Shop) will probably be some Greater Manchester Beers. Been wanting to review some more local beers for a while! On that note…’til next time! “Why did we ever come so far? I knew I’d seen it all before. How I love the voice of Paul Buchanan! 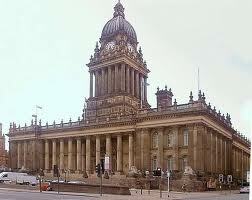 And, for a fully paid up Lancastrian, how I love the beautiful city of Leeds. Stunning architecture, excellent shopping (or so I’m told!) friendly people, great bars. I, it would seem, am well catered for! Having left Bolton at an unfeasibly early hour, Manchester was living up to its nickname of The Rainy City. I packed my raincoat, yet hoped that the other side of “the hill” would be somewhat brighter. Sadly, the White Rose was not in bloom today. So coat on and hood up, a brisk walk to the Town Hall was in order. I was aware that the festival had been expanded to 4 days. I’d also read that there would be more beers, from more breweries than last year. What I wasn’t prepared for was the sight that greeted me on approach to the magnificent Town Hall. The area around the town hall was fenced off for access purposes. 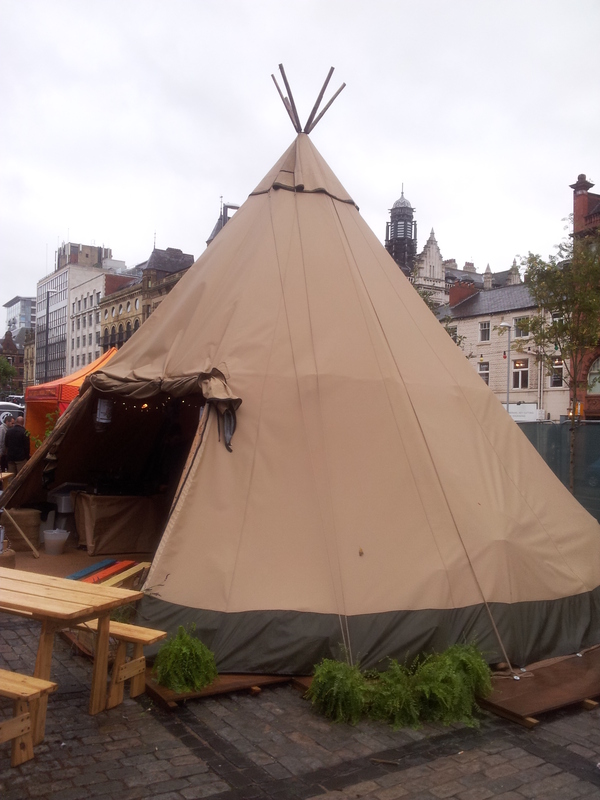 There were huts/sheds, marquees, mobile catering trucks, even a Tipi! Last year, there was ONE facility outdoors – Fish &. All became apparent on entry. The food vendors were all outside this year. However, being from the western side of those hills, my first decision was easy once I spotted a couple of pumps from Quantum. No Mr Krause this year (on MY visit at least), but I toasted him with a glass of his English Pale Ale. A hazy golden 3.9% ale with a “Saisonnesque” aroma laden with yeasty funk notes. A tad warm this, but a lovely fruity balanced pale with contrasting sweet pineapple and tart gooseberry in the mouth with a very dry, lightly bitter, finish. An excellent primer! The beauty of this festival (and IndyManBeerCon – its almost “sister” festival), is the opportunity to chat to the alchemists who make these fine brews. It was with this in mind, that I abandoned my usual social reserve and approached the London Brewers Alliance bar where I spotted two gentlemen sporting the latest in promotional “beer wear” fashion T-Shirts, Logan Pant from Beavertown of Hackney and Gregg Irwin from Weird Beard of Hanwell. Both nice blokes, passionate about what they do and banging out some astonishingly good beers. Whilst chatting, a certain Mr Bailey from Hardknott of Cumbria wandered over to further discuss with Gregg what may turn into a future collaboration brew. Keep your eyes peeled for that one! A brief chat with Dave (get me, all familiar like!) revealed another really nice bloke who also loves what he does. He’s also bloody good at it. One of his beers (Infra Red) has been chosen as one of the 20 beers by Sainsbury for their annual Great British Beer Hunt (beertoday.co.uk). Wish them well with this, if successful, this may be the spark for a considerable expansion for their excellent brewery. Getting slightly busier by now, it was time for another beer, this time Railway Porter from the excellent Five Points Brewing Co of Hackney. 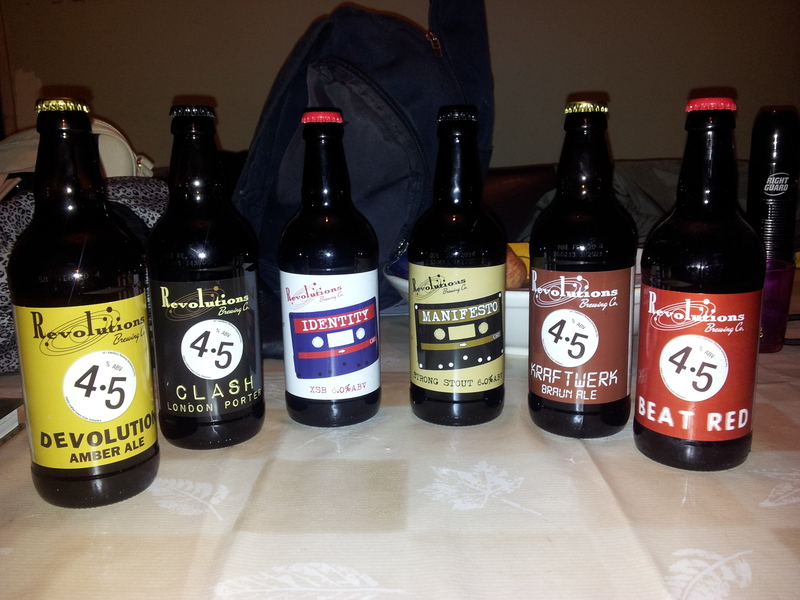 I’ve had a few of their bottles from Damian O’Sheas’ excellent stall at Castlefield Market. Now for some draught on keg. A very dark brown beer which I left to warm slightly. Bitter chocolate and spicy hop nose on this, with more gentle bitter chocolate in the mouth, Nice hopping led to a dry bitter finish. Nice! I caught up with Ed from the brewery later, another top bloke taking time out to chat to customers! Being a thoroughly sensible (some may substitute “boring” if they wish!) 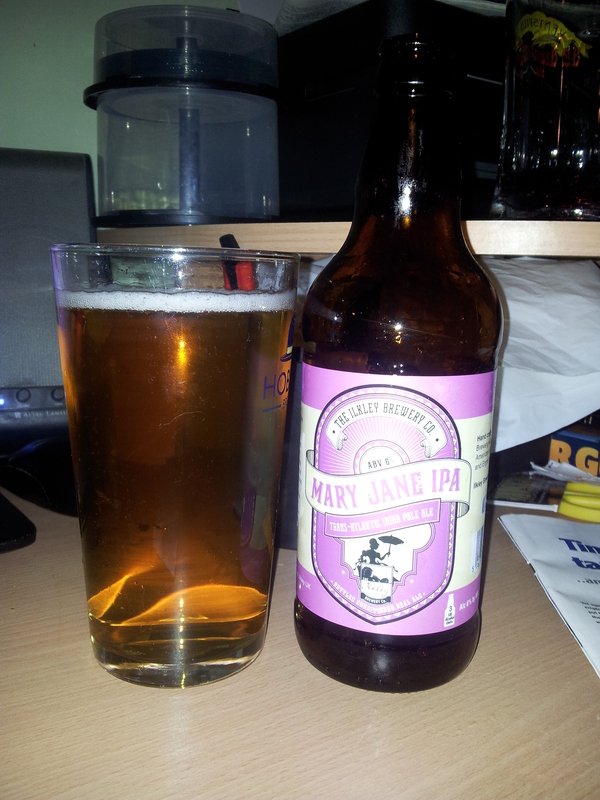 I stayed at the lower end of the abv scale now with Mary Jane by Ilkley Brewery at 3.5%. Another golden beer with an aroma of fresh mown grass whilst also slightly fruity. This was really refreshing and clean with some melon and kiwi hints. Nice dry finish for this which would be great beer for a session. But not the best from Ilkley today….oh no! Having had a brief breath of fresh air (still raining! 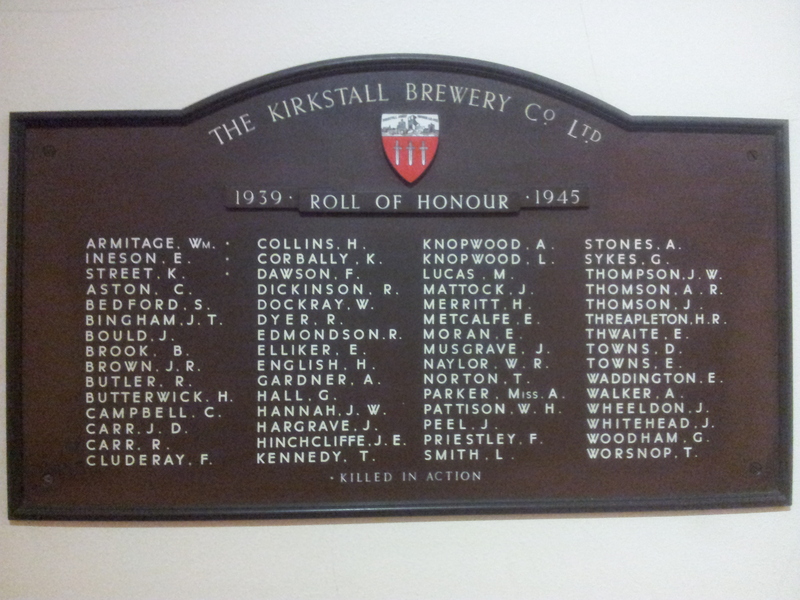 ), it was time to wander back in for a Kirkstall Pale Ale at 4% abv. Another nice juicy golden beer with a light fruity hop aroma with a flavour which, to me, seemed to feature white grape and kiwi. Another really refreshing beer with a dry and slightly bitter hoppy ending. One of the things that stands out for me about this new breed of festivals is the friendly nature of the people that you meet. Today we met a lovely retired couple from near Skipton. Janet and Derek were their names. I sat with them at our table for most of the afternoon and the chats were a joy. Both sharing an obvious love for good beer, Janet loving her Hophead and American Pale from Darkstar and Derek swapping tasting notes (and occasional sips!). 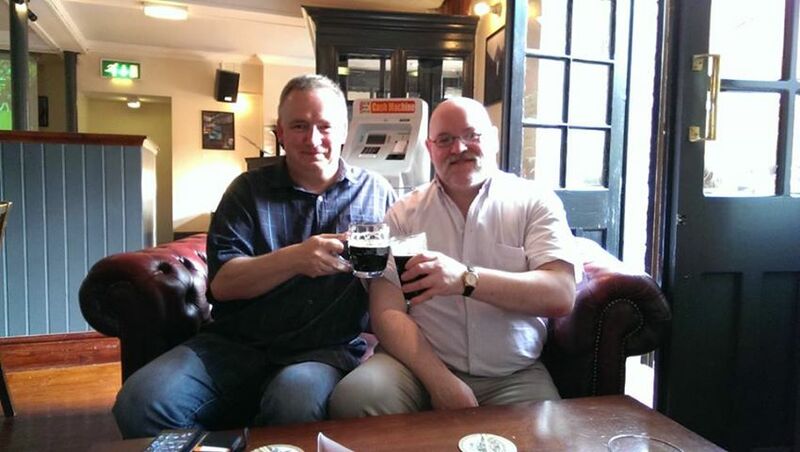 Derek and I had chats encompassing politics, craft beer (and the rather poor regard from some parts of CAMRA – making him think of lapsing his card) and a whole gamut of other stuff. One of a few things that made my day. If they read this – Thank You! This was a slow easy drinking day. No rushing, just good conversation, good food – including the odd Scotch Egg – and superb beer. Which brings me to my beer of the day! 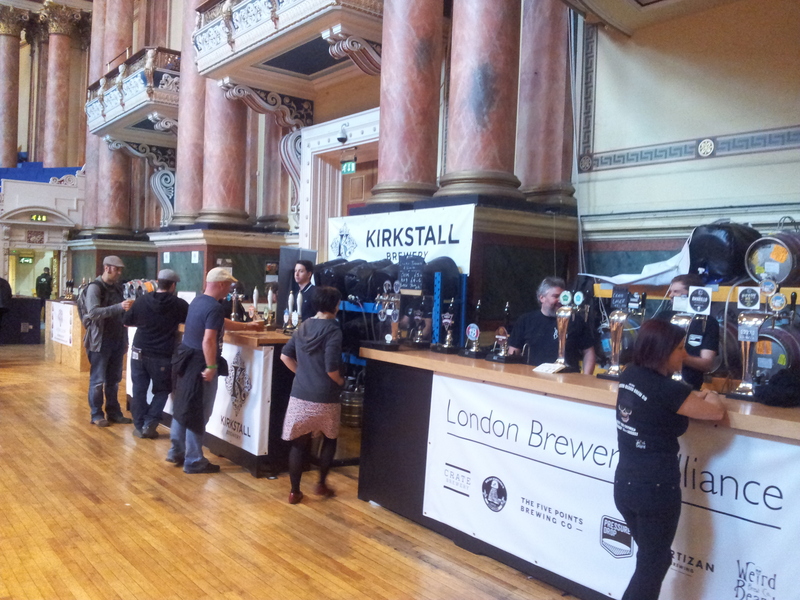 I had a chat with the guys at the Ilkley bar earlier, including Nick, one of the brewers. 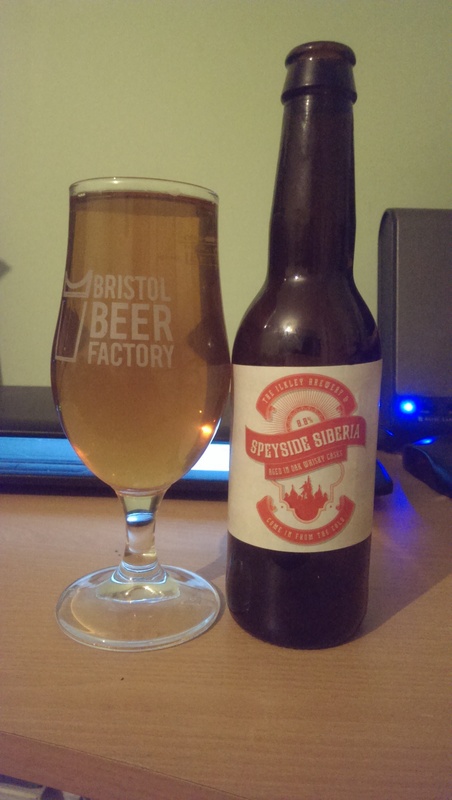 I shared my thoughts on – amongst other things – the barrel aged Speyside variant of their classic Saison, Siberia. I was then pointed in the direction of the kegged Dinner Ale, which I had previously tried in bottle and been left feeling that there was something missing – even at 3.3% abv. I had had it after something stronger, so my taste buds may have been impaired because THIS is a CRACKER! To look at it, you’d immediately think “Lager”. It is REALLY pale. Again, being kegged, I let it warm slightly as it was quite cold. I am so glad I did. Hugely lively at the font, by the time it had warmed slightly I was getting a delicate floral aroma with fruity hints of maybe sugared lemon of tangerine. In the mouth there was a hint of perhaps elderflower before a quite zingy lemon hit me square in the mush! Quite a dry shock that but a beer that rewarded with every sip. Just goes to show that it ain’t always the abv monsters that win the day. Today, Ilkley’s David beat the Goliaths!!! 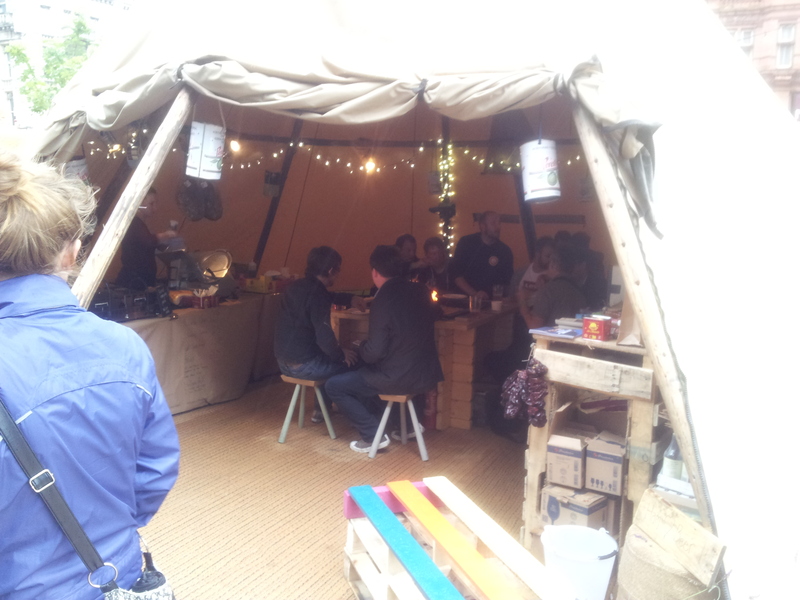 A quick scan of the pop up bar within revealed 6 beers from the Wild Beer Co in Somerset. 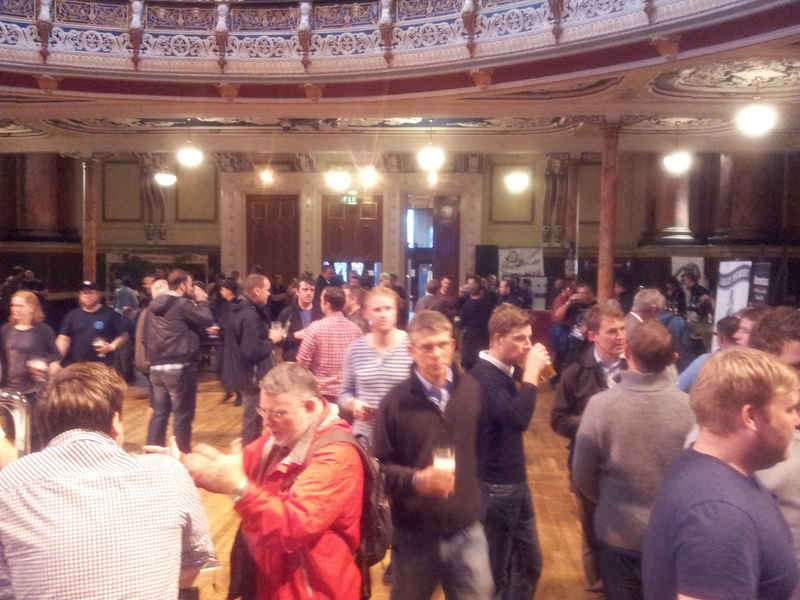 I had already sampled the Collab beer with Fyne Ales “Cool as a Cucumber” at the Marble fest on cask. I therefore hit up a fresh hop beer called er….”Fresh” at 5.5% abv. Another hazy golden beer (unfiltered) which was sharp, fresh and fruity with traces of mandarin. A really bitter spicy green hop resinous finish with this. Coped well with the excellent pulled pork sarnie from the Castros pop up. A really excellent mouthful. Time was marching on and with only 30 minutes to go, it was time for something ludicrous to burn those tokens! Holy Hoppin’ Hell from Weird Beard at 9.7% abv, a Double IPA. This is a seriously BIG DIPA. Sweet malt. LOTS of sweet malt. Intensely fruity and chewy like an orange caramel toffee. Warming with lots of lingering resinous hoppiness. Just time for a quick palate cleanser now. A casked Sambrooks Red Rye at 4.something % (last digit obscured – not my vision!!!). Ruby red beer with dark fruity nose. The bitter rye character came through with some blackberry. An excellent palate cleanser following the Holy Hoppin’ sensory slaughter! This, my chums, is a fabulous festival of beer. 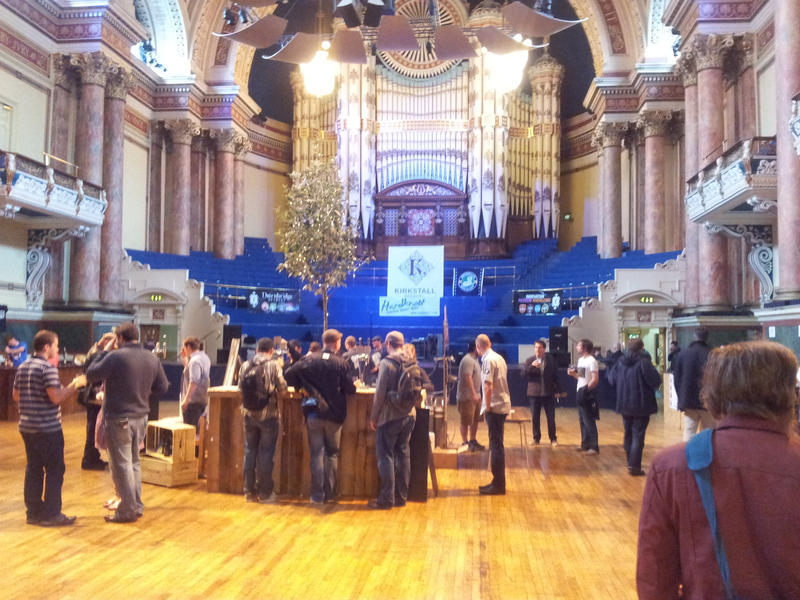 Celebrating what is best about the current progressive UK beer scene in a stunning venue. with huge room to move and breathe, it feels both civilised and incredibly friendly. The brewers are approachable and generous with their time. This event has expanded beyond belief from last year and the organisers are to be applauded for the bravery in this. I feel sure that they will be rewarded today by a bumper crowd. It’s still on. What are you waiting for??? Two things really made my day. One was the conversation and company with/of Janet and Derek as stated above. The other was meeting an old friend. I hadn’t seen Bob in nearly 20 years. We went to college together and were buddies for quite a long while but drifted apart as you sometimes do. It sounds a cliché, but he really hadn’t changed. Still loving live music (he has always had excellent and eclectic taste) and an admirable taste in beer, it was a joy to catch up and chat – albeit, all too briefly. I do hope to get over to Leeds again soon to renew acquaintance in less time straitened circumstances. A quick beer with Bob in both North Bar and Friends of Ham ensued, both bars being excellent with great beer and cracking funky tunage. I hope to reacquaint my self with both of them soon! Bob runs an excellent music website. If you like good tunes, check it out here. A truly excellent day out with friends old and new. My darling Atilla has family in Lincolnshire. Each time we travel to visit, presents a temptation for one such as I. Our usual route takes us within 10 miles of a certain beer shop in Snaith. Yorkshire Ales. Last Monday, Atilla humoured me yet again. Even better, was the fact the Adrian & Vicky opened the shop to facilitate my purchases! It is a pretty little shop is Yorkshire Ales, located in the quaintly named “The Manor House” on Selby Rd. It’s only a small premises with 2 open rooms. Downstairs is the payment area with some non alcohol locally sourced items for sale. Upstairs however, is where the goodies are to be found! The thing that struck me about the shop is the ethos. Ales. From Yorkshire. Simple, but effective in these times where “locally sourced” is a virtue. From the moment I first visited the shop (back in February – seems MUCH longer ago! ), we just got on. Nice people Adrian & Vicky. Nice people indeed. I look forward to my visits, always intending to buy “just the 1 case” but always buying more! Given the fact that both my darling Atilla and my hound remained in the car, the visit was, by necessity, a short one. One of these days I threaten to stay and chat longer, but on this occasion, Adrian & Vicky were spared that ordeal! I was going to pick up a copy of Great Yorkshire Beer by Leigh Linley (the writer of the excellent “TheGoodStuff” blog), but I couldn’t bear to take their last copy! To assuage my loss, they contacted Andrew from Revolutions (my next stop) and arranged for a copy there. Revolutions Brewing started to make their excellent beers in late 2010. I could have sworn that I’d had them earlier, but that must have been before I sold the DeLorean! Following a previous visit to Yorkshire Ales, I picked up a couple of bottles of Manifesto Stout. And was smitten. For me, (in bottle at least) easily the equal of Dark Arts by Magic Rock – a beer that I love. I needed to get more. 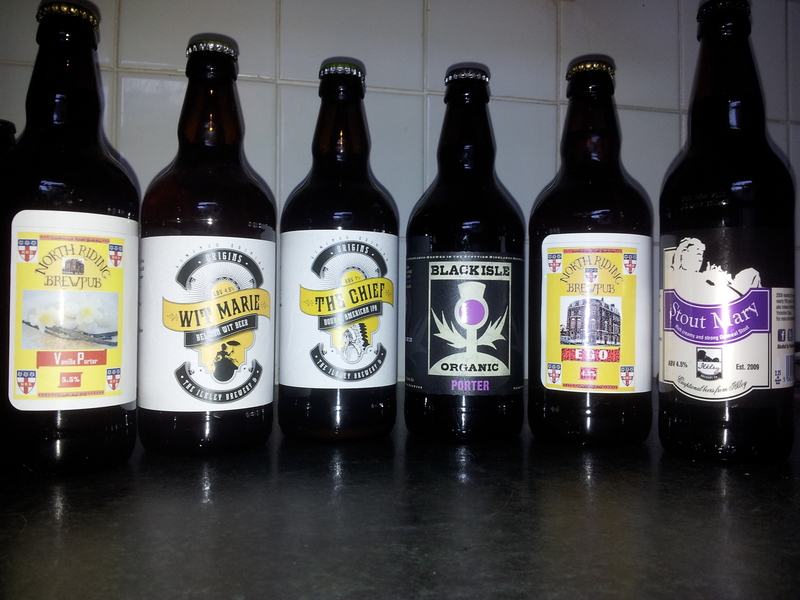 After picking up a couple more bottles from Bierhuis of Ossett, I got the taste. 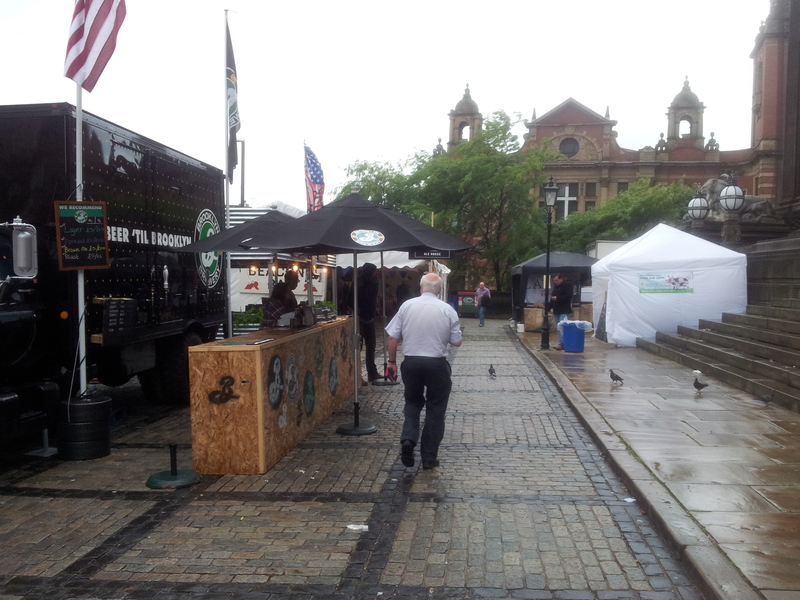 Then, on a stroll following a recent MTB at Port Street……I located some draught at Soup Kitchen! 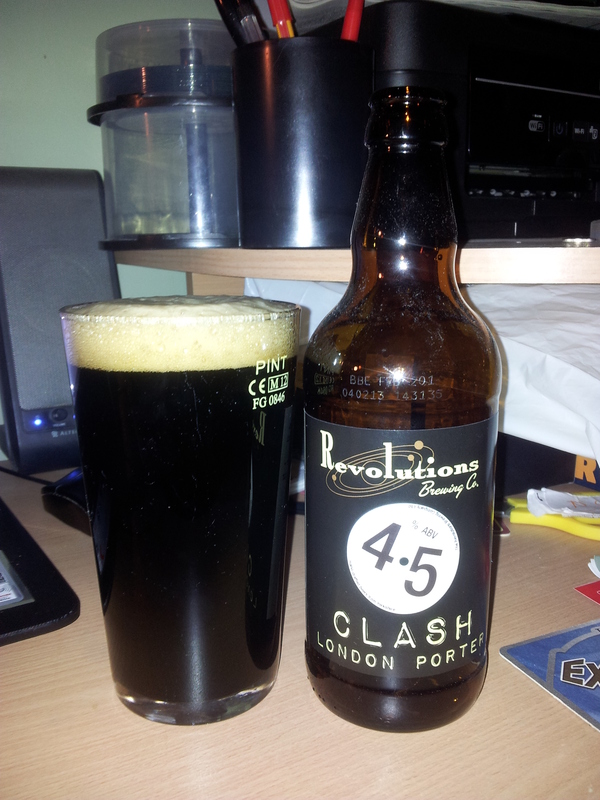 Clash London Porter spotted at Soup Kitchen. A lovely beer. Some time later, I went for a little stroll around Manchester with Andrew, one of the brewers. A kindred spirit on many levels, music, beer, politics. This brings me to the ethos of Revolutions. And why they chime with me. Excellent, balanced, flavourful ales all themed around music. With beers named for Kraftwerk (Braun ale! ), The Beat (Beat Red), The Clash (London Porter) Devo(lution – Amber Ale). All bands of my era, all bands I love. They even made a special beer named Unknown Pleasures after the great Joy Division debut album! All the beers also have alcohol levels commensurate with a music format. So 3.3% – 33RPM (Remember them? Vinyl LPs? ); 4.5% – 45RPM; 6.0% – C60 (Mmmm Tape Cassettes! ), the odd one out being EP at 3.9%. But with an EP being half way between a single and an LP……..geddit? Another good bloke is Andrew. Before he departed from The Crown & Kettle, he invited me to pop in when next in the area. Who am I to refuse? Luckily, this particular Monday was a brewing day! The only request I had, was for a nearby chippy for good old Yorkshire Fish & Chips – in order to sweeten to diversion to Atilla! See below!!! 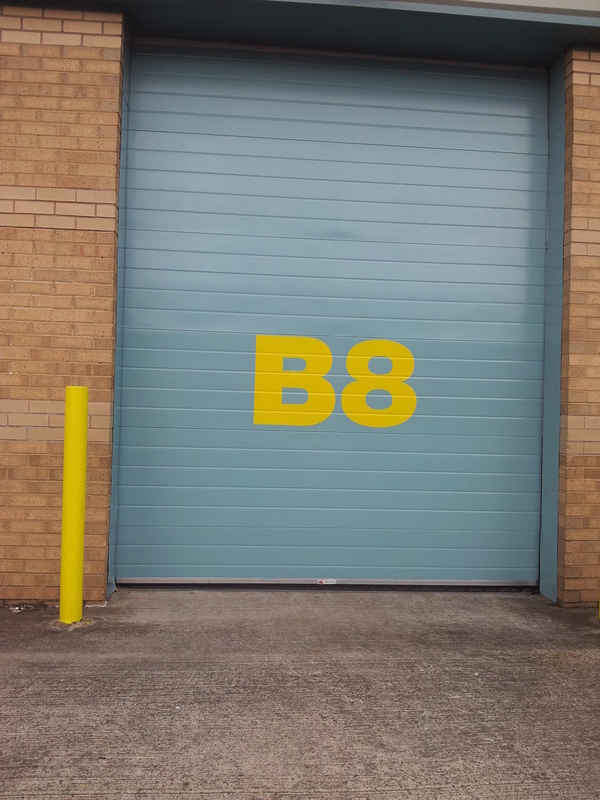 As I pulled up outside Unit 8, the smell of pale malt was in the air. Mmmmmm! Popping out to meet me, Andrew told me they were brewing a session pale ale, which, by this time was in the copper. The smell was lovely! A quick beery chat and a swift tour. 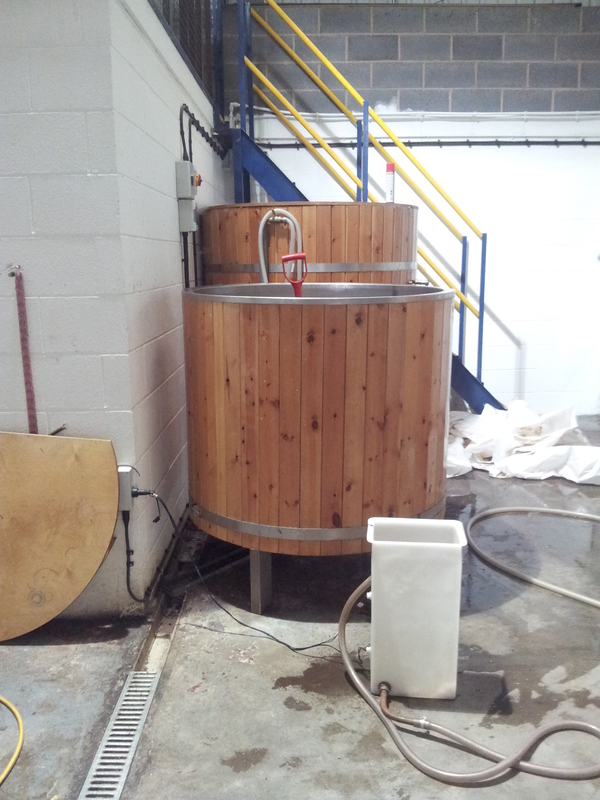 Revolutions use an 8 BBl (Beer Barrel = 36 gallons) mash tun, with the kit originally being installed by PBC Installations of Bury (owned by the legendary David Porter). 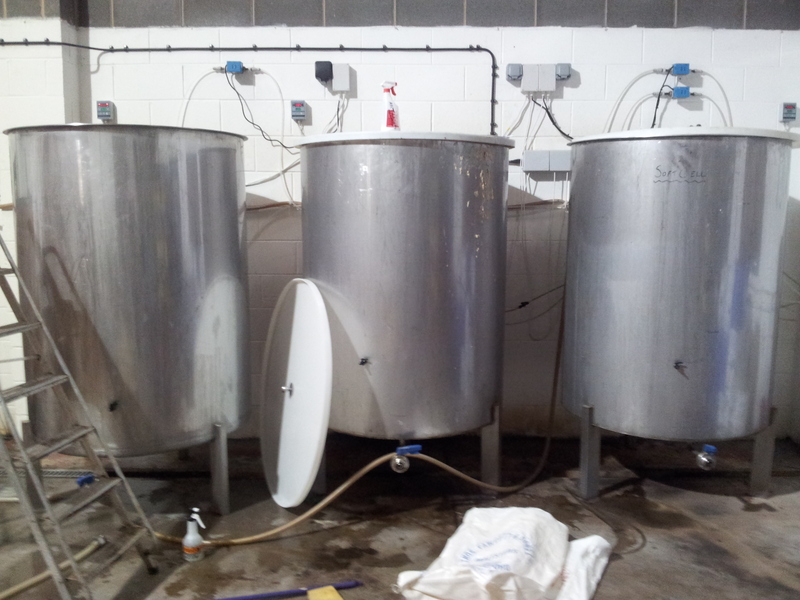 They currently brew 6 times a month and with the kit they have, alongside the space they occupy, have plenty of room for expansion. They now occupy 2 units and have plenty of space for storage. There were lots of empty casks ready for filling and quite a stash in the cold store with a number of “swaps”. This was how I managed to stumble across the Clash in Soup Kitchen, that having been a swap with Rob from Black jack. Another thing I have to thank him for! They make lovely, well-flavoured ales here. But, having only sampled them in bottle, we are missing a trick here in Manchester. This is damn good beer that we don’t see enough of over here. The push starts here! Speaking with Damian O’Shea (@TheAleManMcr) at his excellent stall at Castlefield Market last Sunday, he seemed keen to grab a few over here. It will be nice start. I’m also hoping that Andrew & Mark can pop over later this year for a possible MTB – I’ll keep you posted, of course! One of the reasons I came, was to restock! So I selected a mixed case of 12 to add to the stock from Snaith – with the accent on Manifesto! The only problem I had was not enough money for all I wanted to take! Hence the 12 limit. For the second time on the same day, I was asked if I was going to the Great British Beer Festival. For the second time I pretended not to be jealous! I suppose that’s the hard bit about brewing. The PR bit! A swift drive back and a penance to pay. Dinner to be bought. Payback time! NB – Oh yeah. The lyric at the top…..Keeping in mind the Revolutions ethos, they recently collaborated with Stuart Neilson from the North Riding Brewpub on a Double IPA “Punch The Clock” at 7.8% abv (Anyone remember 78RPM?) – I may start every post with a lyric now! The journey began some time in May. when yours truly stumbled across an offer to two noted beer bloggers/writers Tyson the Beerhound and Tandleman from David Mayhall co-owner of Allgates Brewery in Wigan, being naturally curious and a bit of a cheeky blagger(sic), I finagled an invite from Mr Mayhall and so, on the 8th of June, I found myself along With Tyson, Tandleman, David and Jonathan Provost (head brewer) making a beer (read all about it) ! David and Jonathan kept the three of us regularly updated on the progress of the brew and, as the weeks went on, anticipation grew. The aim was to make an Oatmeal Stout at around 5% abv, but to make it hoppy. At the end of the brew day, David generously offered each of the three of us a firkin of the beer for us to sell to the pub/bar of our choice, the proceeds to go to a charity of our choice. My choices were fairly simple and were given on the spot. I wanted the beer to go to Joshua Brooks and the charity to be St Anns Hospice in Little Hulton. 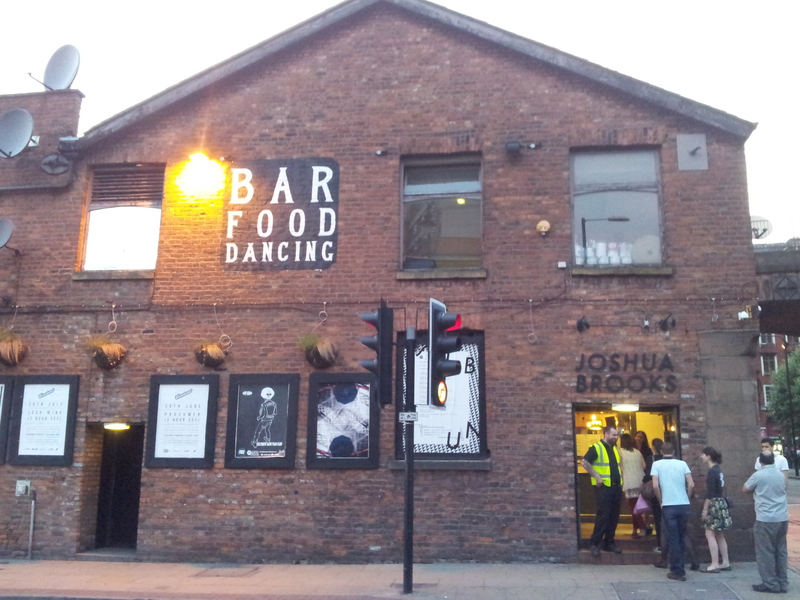 Joshua Brooks, because it is my favourite bar in Manchester. Over the last year, since I first visited the place, I’ve developed a fondness for the place. The ales are kept well by the managers James, Jon & Nicola, there’s lots of lovely leather seating, the background music is pretty much always to my taste and the beer is excellent value. I chose St Anns Hospice because nearly 2 years ago, when my Dad passed away from Stomach Cancer, they gave fantastic support (along with Macmillan) to both Dad and us in his last few days. I’m not one to normally support health charities as I am a firm and passionate believer in, and advocate of, the NHS. However, the people at St Anns do a fantastic job in extremely trying and emotional circumstances. Tyson has sold his firkin to Trackside in Bury (the bar at the East Lancashire Railway station) and it may hit the bar on Tuesday or Wednesday, I hope to sample it there myself . However, mine went to Joshua Brooks. I asked that, if possible, it could go on on Friday 05/07/2013 as I REALLY didn’t want to come to Manchester on a school night and have to restrain myself! However, when James tweeted the message on Thursday evening “It’s on!”, I was mortified. I desperately wanted to taste this beer in Joshua Brooks. Some friends also wanted to try it, so we arranged to meet in the pub at 19:00. I felt like an expectant father pacing up and down on a Maternity Ward! As myself, Colin and his lovely wife Sue entered, it looked quite busy. With a cheery word from the doorman, I hastened to the bar where, someone else had ordered a pint. Irrationally, panic set in. Was there any left? Of course, I needn’t have worried, as the usual dimpled pint mug met the swan neck and the beer was pulled. Black, with a reassuring off white creamy head and a lovely subtle chocolate aroma, initial sensory information was promising much. In the mouth, Daddy was a very proud man indeed! A gorgeously creamy texture, lovely chocolaty notes with a dry, quite bitter hoppy finish. I think it’s safe to say that we achieved what we set out to do. We helped to create a quite creamy, dry & hoppy stout. It is a truly lovely beer that is right up my personal beer street. Conversing with Jaz, whose opinions on beer are usually spot on, summed it up for me. He labelled it as a 5 Star beer. He doesn’t rate many as 5 Star! Those who drank it really enjoyed it and it was gratifying to receive universally excellent feedback. I was a relieved, happy and refreshed man. The was an excellent beery lineup as usual. With beers from Allgates (Gin Pit), Ilkley (The Mayan) and the excellent Privateer (Vanilla Jack), there was plenty of choice for me and my pals. After another Quaker House, I opted for a Gin Pit and The Mayan. Rather strangely, the Gin Pit had virtually no head but tasted superb, with more of the slightly astringent juniper flavour than I recalled when I had it at Trackside. A nice refreshing pint, as is standard from Allgates. 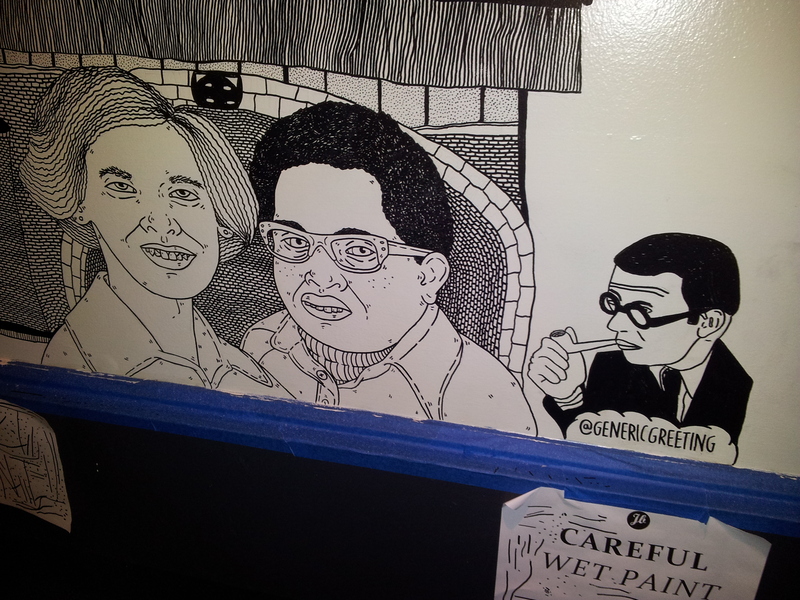 Sue, on returning from the conveniences, told me that there were some artists creating a mural on the walls with marker pens. Intrigued, I had a look…. ….I had a chat with the two guys who were creating the “Muriel” (ah…Hilda Ogden…). I can’t speak for all, but this looks superb. The Mayan was a beast of a different hue. A chocolate and chipotle chilli stout at 6.5% abv. Black, with a creamy head (both colour and texture) and huge dark chocolate aroma. Lovely and creamy, lots of chocolate, slightly smoky with a gentle spice heat building the deeper I waded in. First time for me with this beer. I’ve previously seen excellent reports from others on this beer. All justified. After having the Mayan, I bottled it with the Privateer Vanilla Jack not thinking I could do it justice after such a big beer. Colin gave it a big thumbs up and I will drink that one soon, especially as they’re brewing it again. 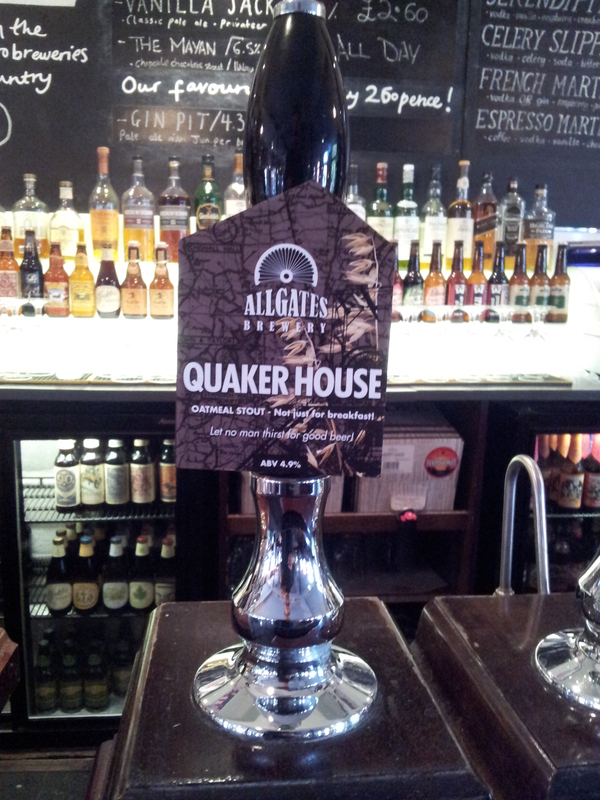 I decided therefore to venture back to the beery cradle for another Quaker House. Mmmm…lovely! Having heard from Nate Dawg, another excellent beer blogger that there might be some beers from Redwell (new Craft brewer from Norfolk) on in Font, I thought we’d better pop in! Font was as busy as usual. No sign of the Redwell. Maybe it was in bottles, but I wasn’t in a bottle mood. I spied a Pale Ale Citra by Quantum and looked no further. 4.5% abv and er….pale, more Citra mango and grapefruit aroma. Lovely and smooth, lots of citrus flavours and a nice bitter dry finish. Another belter from Mr Krause. I hadn’t been to Paramount for a while to have my Paramount (Elland 1872) Porter nightcap, so, I did. It is what it is, this beer. Chocolate, coffee, smoke and OH SO creamy and delicious. A deserved award winner and a permanent at Paramount. £2.60 a pint. It felt like I was stealing it! With Colin & Sue being my chaperones and guaranteeing my safe return home, we headed off for the usual First Bus chariot. The No 37! An excellent evening with some of my best friends. My baby tasted superb. Excellent conversations and fun lubricated by superb beer. Tandleman would most certainly approve! As I have said on many occasions, both on this blog and in many a conversation, this is truly a Golden Age for beer in the UK. You can walk into lots of bars / pubs around the country and sample exceptional beers from far and wide. For that, drinkers should rejoice. However, I am increasingly conscious of the amount of comment given to beers from outside of the UK. Be they from the USA, Belgium, Germany, Italy or wherever, these undoubtedly excellent beers get praised to the clouds. But there is an absolute wealth of beers being brewed by small micros in this country that are superb in their own right. Also many of which are not in thrall to American techniques or styles. I don’t want to be misunderstood, I adore good beer wherever it may be sourced from. As you will see below, one of the best beers I’ve had recently was made by Sierra Nevada in California. But there is THAT much excellent beer being brewed by UK micros (yes, many using New World hops in many instances! ), that that is where my future focus will be when I review bottles. UK Microbreweries. With my recent visits to both Yorkshire Ales of Snaith and Bierhuis of Ossett, it’s obvious to me that I’ve barely scratched the surface of the number of breweries in one county alone, Yorkshire. I won’t be able to try them all. But I’ll have a bash! There. Now here’s some belters that I’ve drunk recently……. The format remains the same. 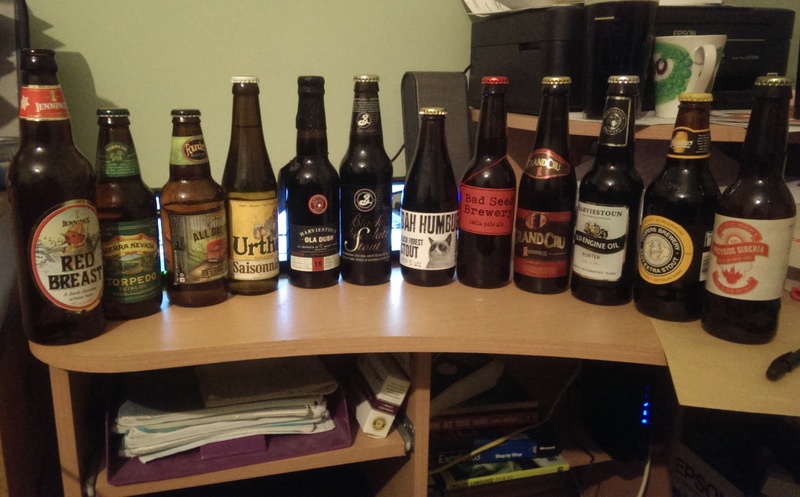 I give you the beer, who brews it and where, the alcoholic strength, the style of beer, where I bought if from, bottle size and how much I paid for it. Simples! I like the ethos of Revolutions. “Music-inspired beer. Craft brewed in Yorkshire”. All of their beers have a musical themed name. They also brew to abv strength associated with music formats. 3.3% (33 rpm), 4.5% (45 rpm), 6.0% (C60 cassette) etc…. So before I taste the beer, I’m favourably disposed. My first bottle I tried was the Manifesto Strong Stout. That was my bottle of the month in April. Could this live up to that standard? I’ve also snaffled a bottle of their Devolution Amber Ale (named after the great De-Evolution – DEVO – from Akron, Ohio). Can’t wait! It’s good to see an increasing number of Ilkley beers ‘over the hill’ now. Booths stock a good range and I even saw Mary Jane at Sainsbury in Bolton today. Things are looking up for Ilkley lovers! However, unless you live in Manchester city centre and can pop into Beermoth on Tib Street, you won’t get some of their ‘specials’. However, this doesn’t appear to be a problem for specialist beer retailers in Yorkshire. On a recent camping trip, I was advised by the owner of Bierhuis (David) that I was only about 20 mins away. How COULD I resist? It was here that I picked up this beer up (David put a couple aside for me). I drink this almost everywhere I see it on draught. A great beer. But I’d never had it in bottle. So, when I saw an offer of 6 assorted bottles for £18 at Port Street one hazy evening, what was I to do? This was another lively devil on pouring. A tan coloured head gave off an aroma just like when you tear open a packet of ground coffee. Just like that! But with a hint of spicyness. A lovely smooth texture in the mouth where those coffee flavours came to the fore but with a little touch of roasted malt sweetness. I love this beer on draught and the same applies with the bottled version. Another 4.5 beer! Not being bottle conditioned, I was surprised by the liveliness of this beastie. Golden, with an abundance of grapefruit citrus zing on the nose. In the mouth, this was more balanced than the aroma hinted at. 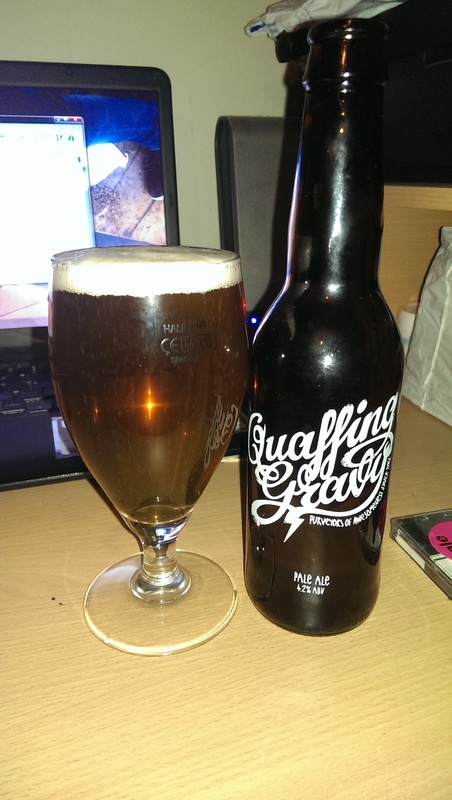 Grapefruit yes, but mellower and balanced with a malty digestive biscuit like sweetness. As smooth as cream in the mouth with a dry grassy bitter finish. This gets a 5 rating on value alone! Superb. Thank you Bierhuis! 5. 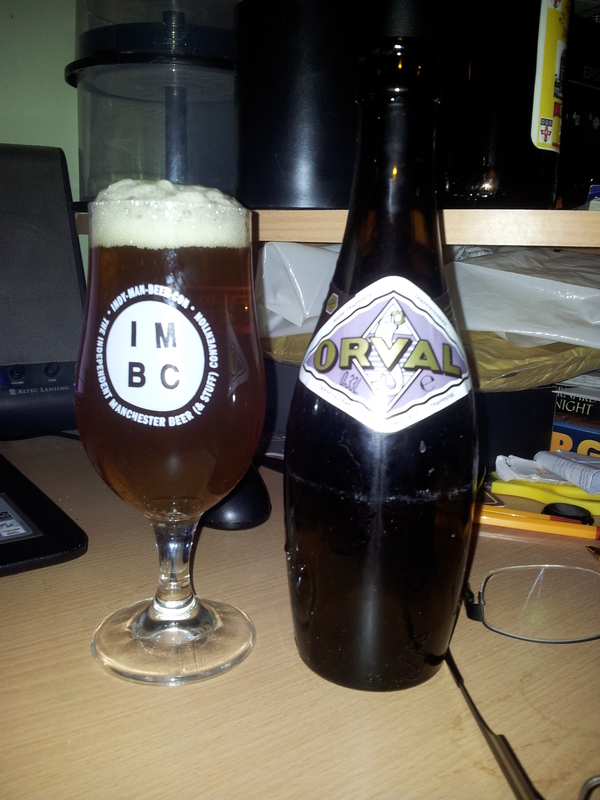 Orval by Brasserie Orval (Villers-devant-Orval, Belgium) – 6.2% abv – Trappist Beer – £3.20 (330ml) – Pendle Witch PH, Atherton. Confession. I had never had an Orval prior to this. At THAT price, I felt like I’d stolen it! Again, thank you Bierhuis! Bottled – As if you hadn’t guessed! Narwhal by Sierra Nevada. For the reasons stated above. A superb Imperial Stout. Draught – Imperial Black (Black IPA) by Buxton Brewery 7.5% abv (Port Street Beer House 26/05/2013). I am incredibly grateful to Jamie H that he got 4 halves of this out of the end of the cask! Smooth as silk, black as sin. Incredibly fruity whilst still having some roasted stuff in there. This was an awesome beer. I will drink it wherever I find it. It is THAT good! On that excited note……’til next time! Yes. I know we’re now in May! But having had a couple of visits to those excellent Yorkshire Ale Vendors – Yorkshire Ales of Snaith & Bierhuis of Ossett – It’s high time I purged myself of bottled beer opinions and made space in the (ahem) cellar for this new influx of hoppy and roasty goodness. So there! 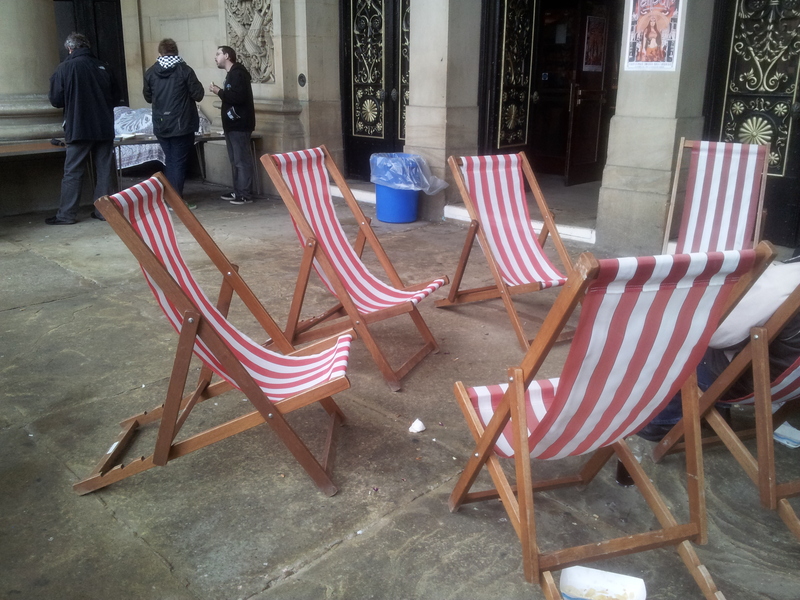 Is Huddersfield the Burton of Craft Brewing? 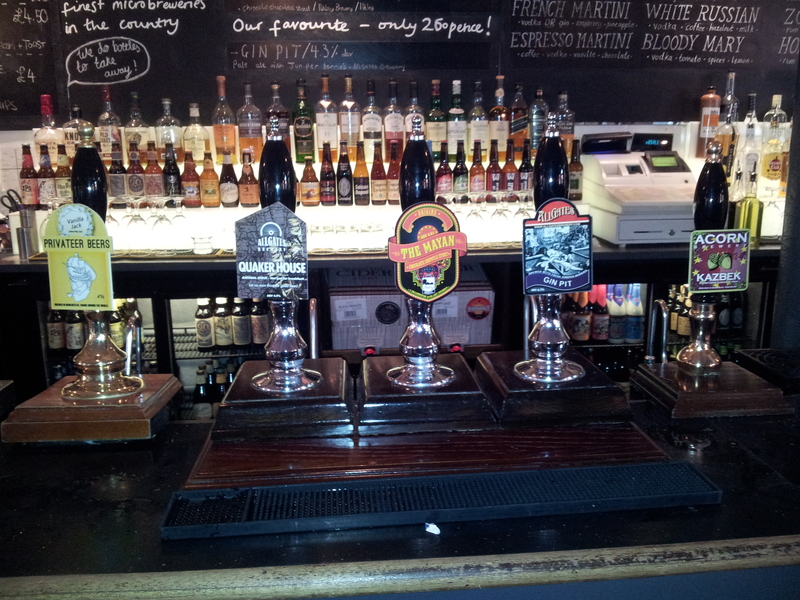 Magic Rock, Rat, Summer Wine (not far away) and last – but by no means least – Mallinsons. Until I woke up to this new golden age of beer last year, I hadn’t heard of, let alone tasted, Mallinsons. I’ve had some on draught, but further remedied this in my visits to Snaith and Adrian & Vicky Pettit’s shop, Yorkshire Ales. On my last visit I picked up a few of the Single Hop range, of which Columbus is one. This is a pale golden beer with an intense fruity hop aroma. A full flavoured beer this with really resinous bitter hop flavours. Dry, fruity, spicy and refreshing. More intense than their Aramis (made with a French hop). I recommend this if you can get it on draught. A full flavoured beer you could drink all evening. This was golden coloured with a slight haze on pouring. The tropical citrus fruit aroma hits you straight away and (strangely) reminded me of a fresh fruit flan! Some sweet biscuity malt and assertive hops, apricot bitterness which faded gradually to leave an earthy grassy dryness in the aftertaste. This is some beer. A supermarket stalwart! (Sainsbury do the 660ml bottles). Being bored a couple of Fridays ago, I clocked off early and popped to Media City to check out Booths deals during one of their “Beer Festivals”. A few interesting bottles at 4 for £6, but 3 bottles I had never seen before took my eye, this among them. The weather has been chilly recently, so I left this outside to cool, probably for too long as, when opened, I only got a slight fruity aroma. A golden – bottle conditioned – beer, this had a lovely sweet malt backbone matched with a spicy, fruity bitterness. Like a hoppy french kiss dancing around my tongue! Mmmmm….. A very dry finish with some almost herbal grassyness in the afters. I though I detected something else, maybe a touch of rhubarb. I may be talking utter garbage there, but this is a really lovely beer. A recommendation at any price. But at £2.29……..!!!!! Anyway, the beer! Black with a tan head on pouring. The aroma? If I hadn’t read the ingredients, I’d have sworn that there was some port or rum in there! The aroma eventually mellowed to a strong dark chocolate. A really smooth full texture in the mouth. 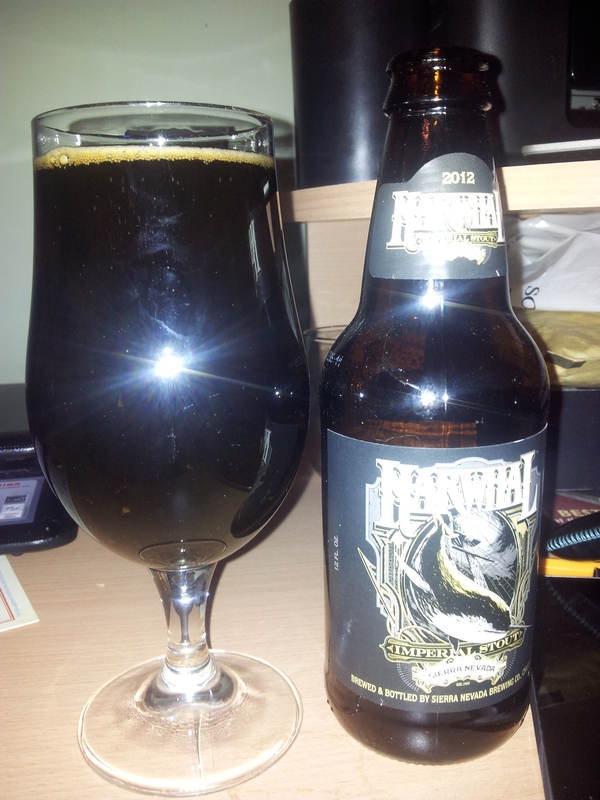 This is a malty mouthful with loads of roasted flavour with plenty of bitter chocolate, whilst being smooth and lush. Dry and earthy aftertaste. It’s a damn good job that this is rarely on cask. I’d never be out of the pub! Another one of my surprises from the recent visit to Booths. I am a HUGE fan of their IPA & Stout (not too taken with the XB though) which are two of my top 5 supermarket bought beers. 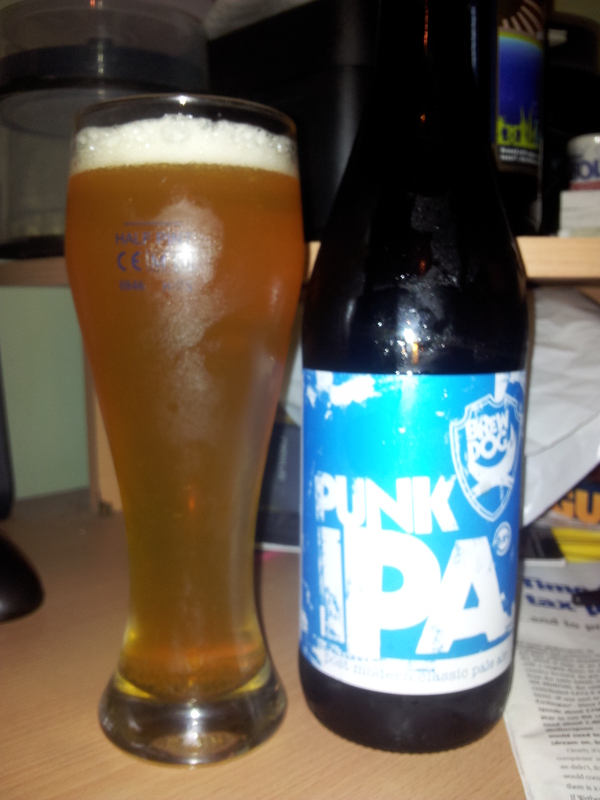 I had only seen this one at Micro Bar and at the SIBA fest last year, so was quite chuffed to find it in the aisles. Deep gold with a light apricot citrus aroma. Lovely texture with a marmaladey bitter fruity flavour prominent. A slight warming sensation from that there 6.5%. That fruitiness faded to leave a dry hoppy grassy note. Another recommendation at the price! 6. Chocolate Cherry Mild by Dunham Massey Brewing (Altrincham) – 3.8 % abv – Mild – £3 (£9 for 3) for 500ml from Bents Garden Centre, Glazebrook, Warrington. A colleague of mine claims this as his favourite draught beer of all. Haven’t had it on draught yet (Molly House do Dunham Massey, I think), but when I saw the bottle, I had to give it a go. Didn’t I? A deep ruby coloured beer. I didn’t initially get any cherry in the aroma, more of a choccy toffee thing. The first taste was of a really good, standard mild. But then the cherry and chocolate start to insinuate themselves and wrap around your tongue. Just one word for this. Yum! If I see it on draught, I’ll be all over it like a rash! Beers of The Month ? 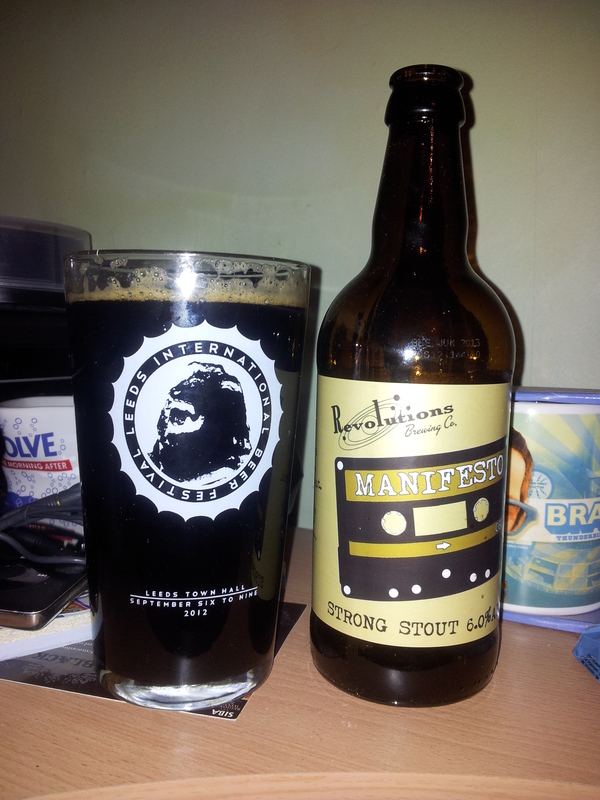 Manifesto by Revolutions Brewing – For all the reasons mentioned above. A gorgeous dark, dirty and dangerous Stout/ The rocks upon which this ship could happily get wrecked! In The Black by Wilson Potter (Middleton). A 4.2% Stout. Had this twice this month, firstly at the brewery and secondly at The Salford Arms. Gloriously lush, creamy and roasted with a slight smoky tinge. Just a simple dry stout, made well. Good to start seeing their stuff ‘in the wild’. I’ve quite enjoyed this month. 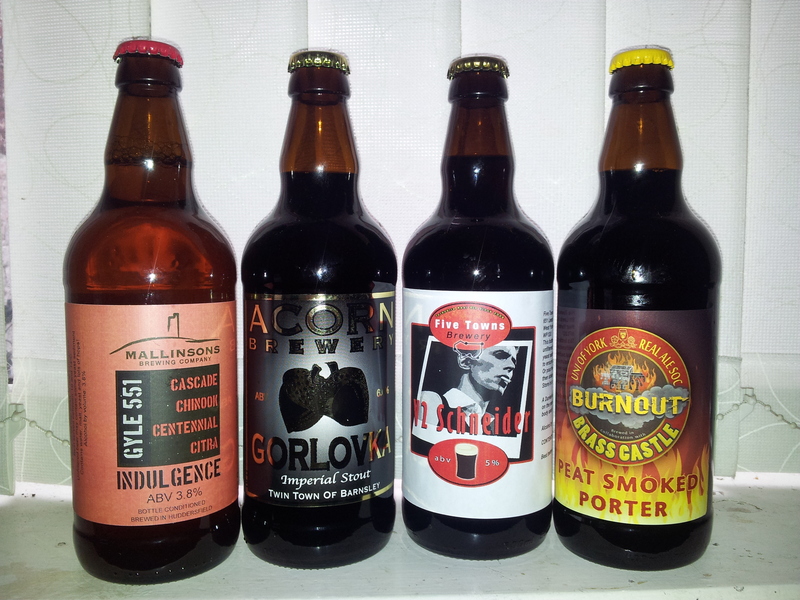 A quick visit to Adrian & Vicky at Yorkshire Ales at the end of March, helped to replenish my supplies with some excellent beers from Yorkshire (See below!) and a ‘spur of the moment’ visit to Booths – at the end of the month – revealed a few beers I haven’t seen in supermarkets over here before – at great value. Really pleasing. I hope in May to pop to Snaith again as well as nipping over to Ossett to Bier Huis (need some more Green Goddess by Ilkley – again, see below). I haven’t anticipated my visits down the A1 to my out-laws as much in many a year! The downside to this month being a chat at my local doctors surgery. Well. What do you think I’m going to do? Write a blog about mineral water and decaffeinated tea??? Anyway, back to that most historically healthy of drinks. Beer! You known how this works. I tell you about the beer, how it tasted (to me), where I bought it from and how much it cost. Needless to say, I enjoyed them all. As would you, (in all likelihood) if you bought them. As mentioned earlier, At the end of last month, I detoured the family jalopy off the A1 towards Snaith and Yorkshire Ales. This really is a pretty little shop stocking some superb beers (almost) exclusively from Yorkshire. Adrian & Vicky were their usual friendly selves. Next time, I hope to chat more. However, if they’re as busy as they deserve to be, that could be difficult! 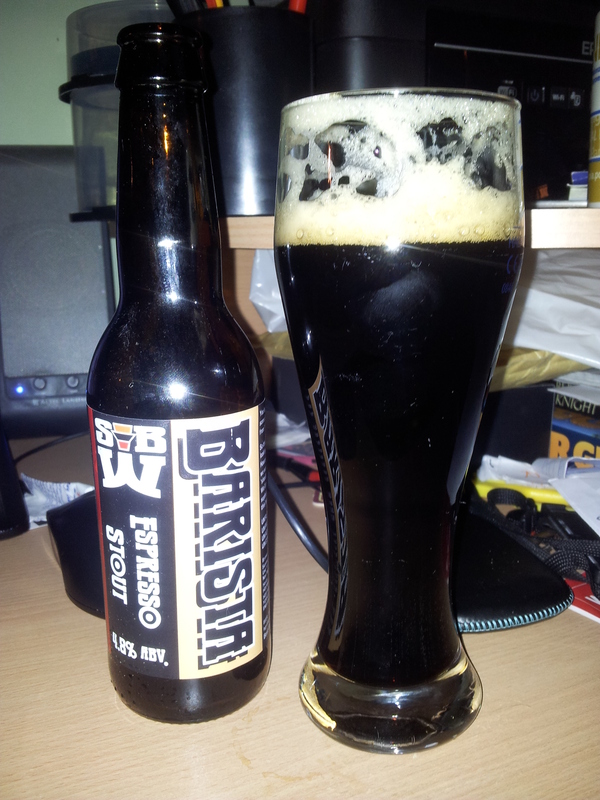 A deep dark coffee aroma on the black beer with a light tan coloured head. The aroma didn’t prepare me for the flavour. Fabulously earthy with bitter chocolate and licorice in the mouth. A lovely warming feel as the beer sank into my eager tummy! A nice bitter aftertaste with (what seemed to me) more than a hint of creme brulee or caramelised banana. Just a bloody good example of this great beer style. YUM!!! It is (like Siberia Saison) the product of a collaboration between the beer writer Melissa Cole (I got her excellent book ‘Let Me Tell You About Beer’ for my birthday last week!) 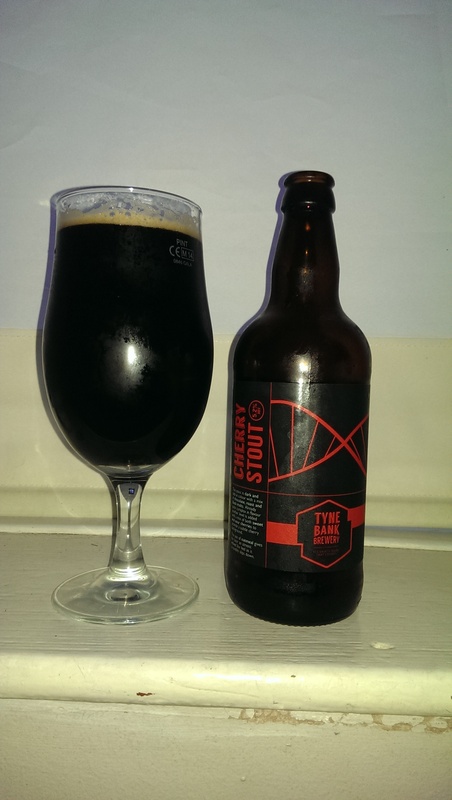 and Ilkley brewery from, er…Ilkley. I had the cask conditioned version of this beer at Common in Manchester’s Northern Quarter last November and was suitably impressed. I wondered how the bottled version would fare…. I needn’t have worried! Bottle conditioned, it was lively out of the bottle and poured a deep golden colour. The aroma had that Belgian funk to it with some fresh herbal notes and initially I was reminded slightly of Duvel. However, in my humble…….this is SO much better. The taste? WOW! Break out that bass guitar and give it a damn good slap! More of that Belgian funky stuff going on, so much so, I had to reach for the tunes and slap on some Sly Stone! Some nice resinous hoppy grassy stuff going on courtesy of those fresh green hops. Nice grassy dryness after as well. Easily as good, if not better than when I had it on draught. I believe they may still have some at Bierhuis in Ossett. Guess who I tweeted before I published this???? A lovely gold colour here with a powerful citrus hop aroma, I thought I detected apricot. Hell, what do I know! Given the aroma, I was expecting a punch in the kisser from all those American hops. What I got was a lot more subtle, but damned tasty. 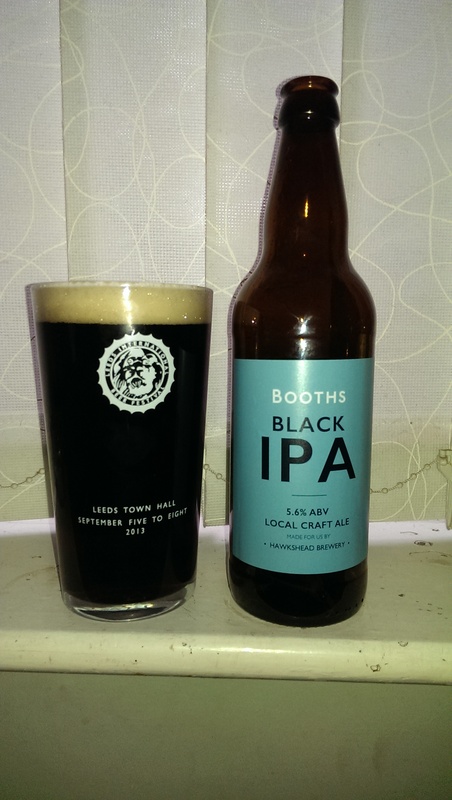 A black beer made with the addition of Pontefract cakes (ie : Licorice). This may sound STUPID, but this had a very dark aroma reminiscent of an Imperial Stout, vinous and spicy. Now, back over the Pennines! Obscure from Tatton was my favourite bottle of last year. I still love it. A glorious black beer. I thought it was about time that I tried one of their paler offerings. Pouring a dark gold colour with a nice lacy white head. A malty aroma with a hint of orange zest. Lovely juicy malt flavours with some toffeeness in there. Nice and smooth mouthful. Some nice hoppy dryness in the finish to give it a really nice balance. On the back of this, I bought some of their Ruck & Maul porter from Booths last night. Can’t wait! 6. Bon Don Doon by Wilson Potter (Middleton, Manchester) – 4.2% abv – Blonde Ale – £7 for 3 bottles (500ml) – direct from the brewer. A lovely pale golden coloured beer. 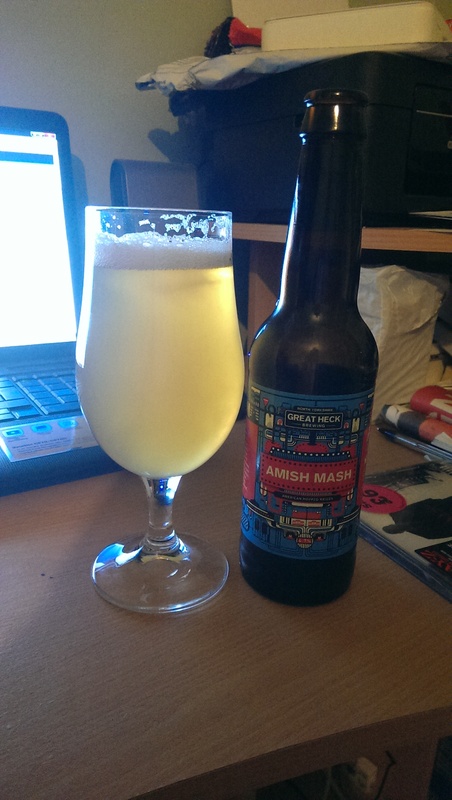 An interesting almost sherbet like aroma from the hops, quite zesty like a sherbet lemon. 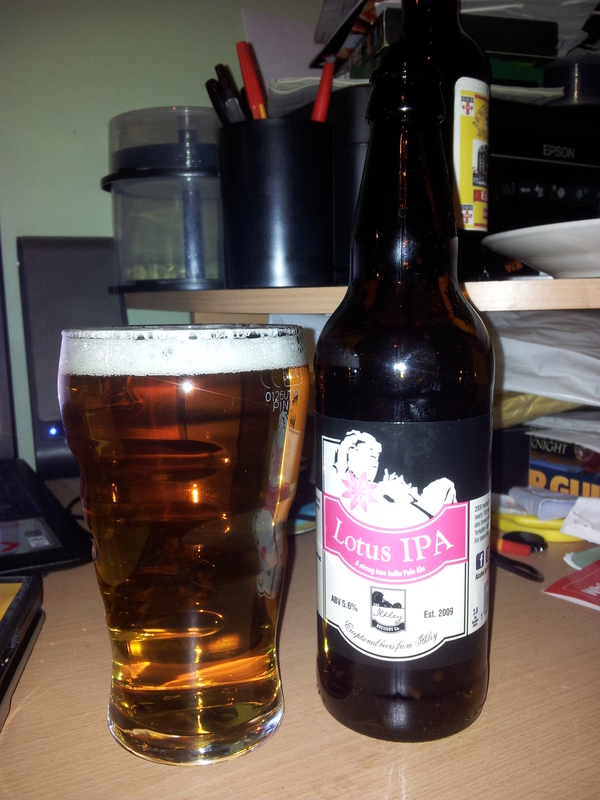 Smooth in the mouth, nicely balanced with some hoppy flavours I can’t quite pin down. A nice, dry almost grassy aftertaste. Another refreshing beer from this brewer. Nice to see some of their draught beers around Manchester. 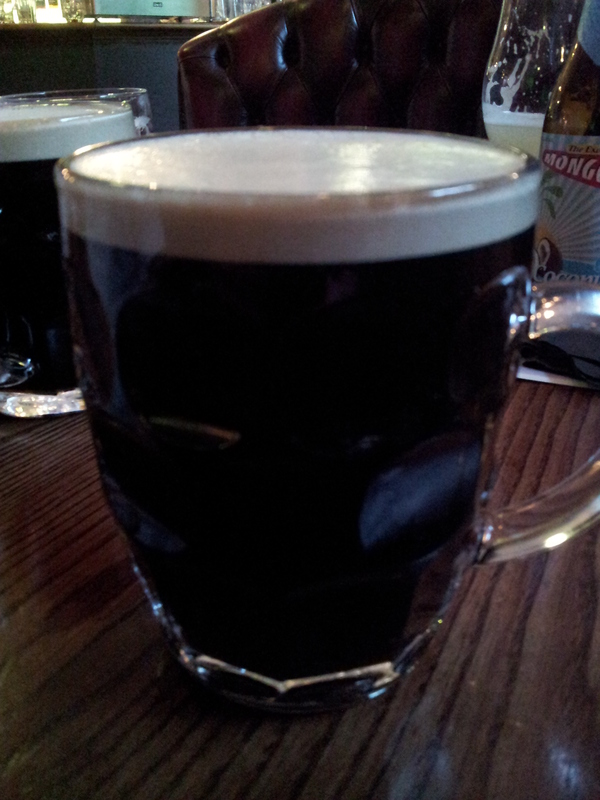 I had the In The Black stout in The Salford Arms the other evening which was lovely and smooth. Excellent local brewers. Back to the east of the Pennines again. This deep ruby almost black beer (trust me, hold it to the light!) 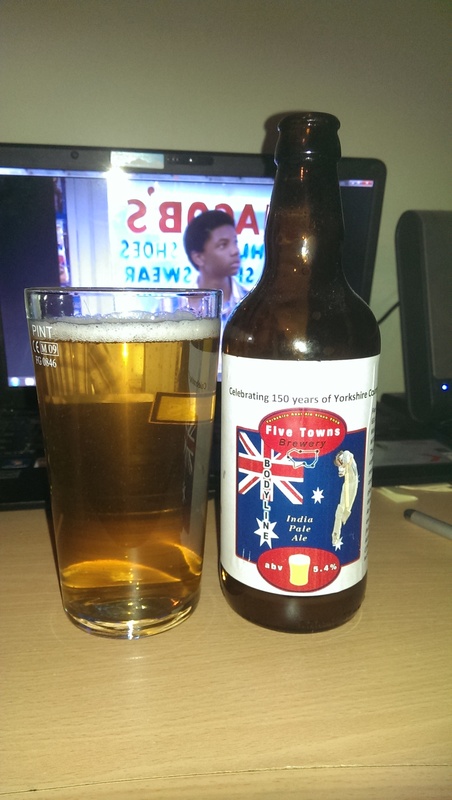 has a lovely beige head with a nice – but not overpowering – citrus aroma from the Cascade and Citra hops. A complex combination of flavours here. Citrussy hop combined with something much darker, some bitter chocolate and licorice I thought. With 5 different malts and 6 different hops, you’re certainly getting your moneys worth here! This beer is simply chock full of flavour and superbly balanced. Full of flavour with a nice dry grassy aftertaste. Black IPAs aren’t loved by all, but this is superb. Saltaire, I doff my (metaphorical) cap! More pub related blather soon! On that note…….’til next time!